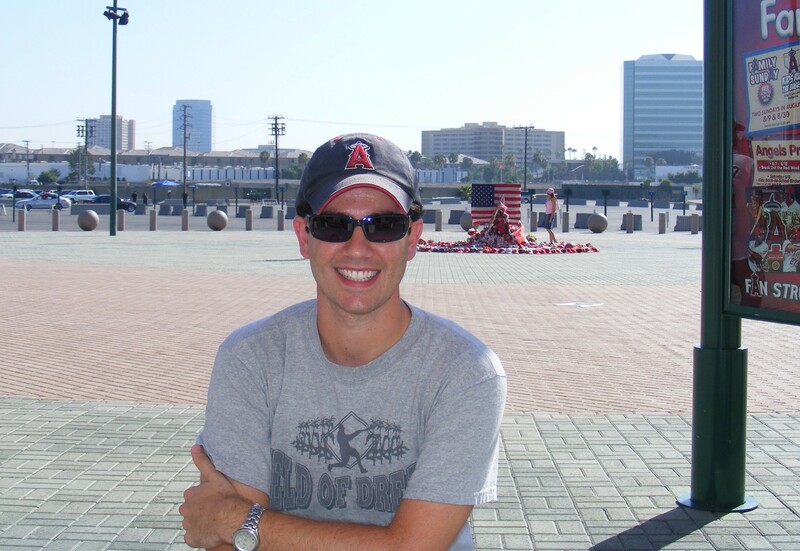 One SoCal native's thoughts on baseball, the games he attends, and how that affects life. My first game of the 2012 season had finally arrived. 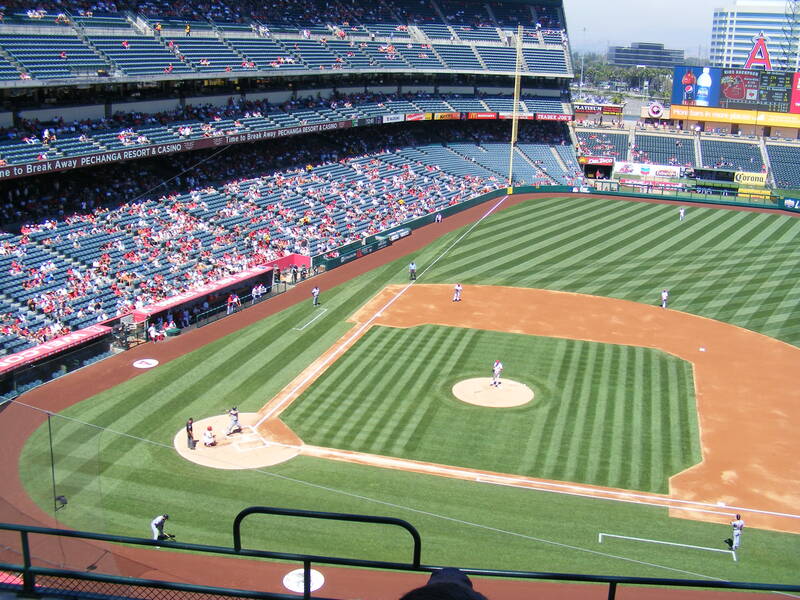 It would be the Los Angeles Angels of Anaheim (boy, I hate that name) against the Oakland Athletics. 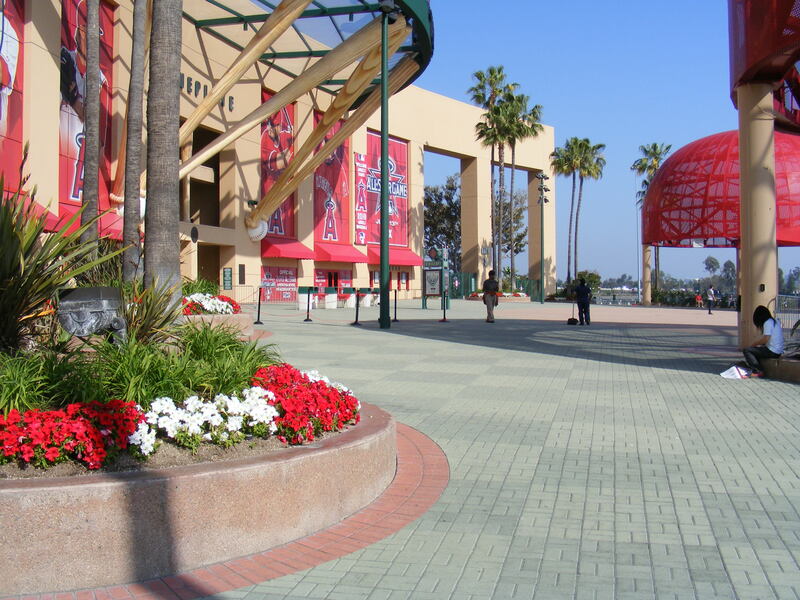 Jered Weaver would be pitching against Brandon McCarthy and I would be there, first in line, ready to go, when the gates opened up. I was psyched. 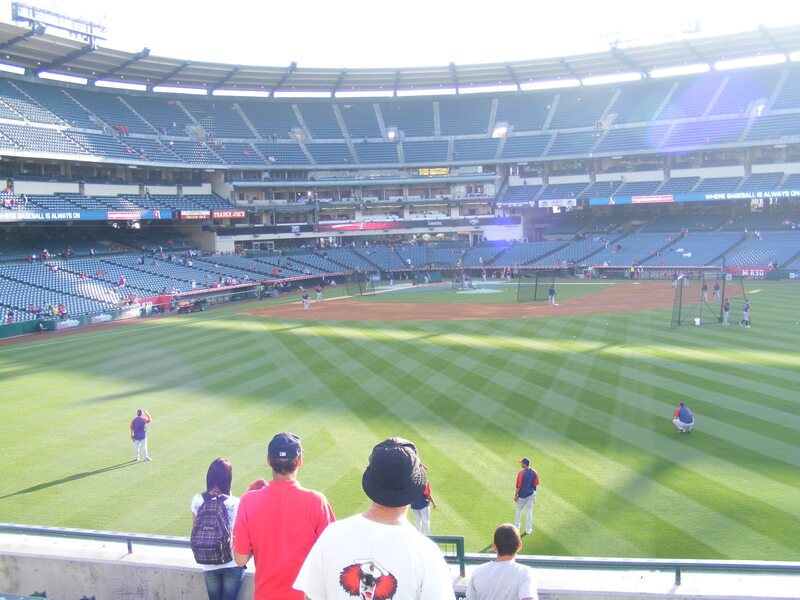 I packed my bag for the first time–team rosters, bottled water, my camera, and the assorted accouterments associated with attending an Angel game… or any MLB game, I suppose. 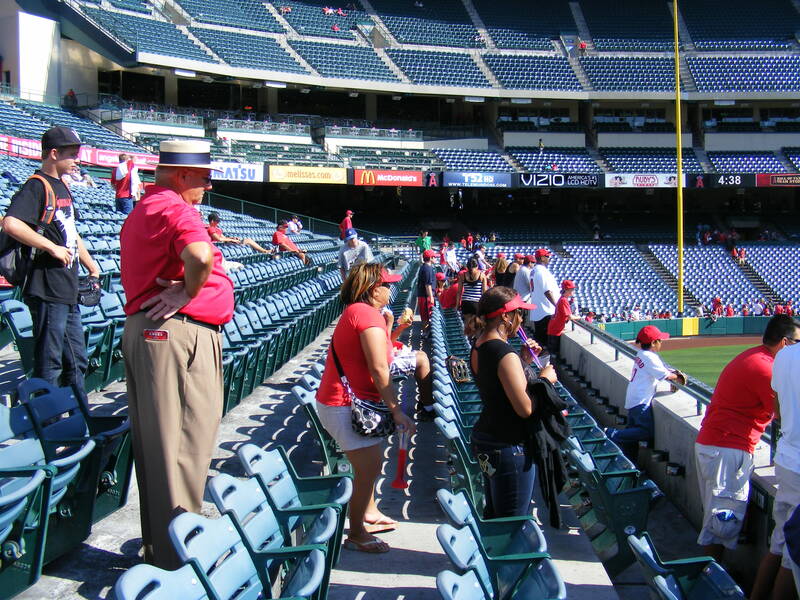 I small-talked with a few of the Angel Stadium BP regulars while I waited. Rob, Eli, Terry, Lou… a bunch of guys I’d have never know had it not been for this fun hobby I developed way back in 2008. Well, I got my bagged checked… and headed inside to the folks with the ticket scanners. All this anticipation, I’m the first one through the gates, and, wouldn’t you know it? The lady I went to was having scanner problems… ugh. I watched as people in other lines flooded in past me before snatching my ticket from her and thrusting it into the next ushers face and telling him, “Hers isn’t working. Please scan my ticket.” He did–I was direct but polite, after all. And I took off running. As I rounded a corner on the Terrace Level I could see a couple of guys were already scouring for Eater eggs in the right field seats so I decided to change my strategy. I took a hard left down some stairs and that’s when I looked at the field for the first time. It was beautiful–perfectly manicured, actually–but there was something very wrong. The hometown Halos weren’t hitting. There wasn’t a single Angel on the field. As it turns out, they’d gotten in from New York at about 3am so they had decided not to do a full BP session. I quickly changed tactics and ran straight down to the front row along the third base line as the A’s started to play catch. 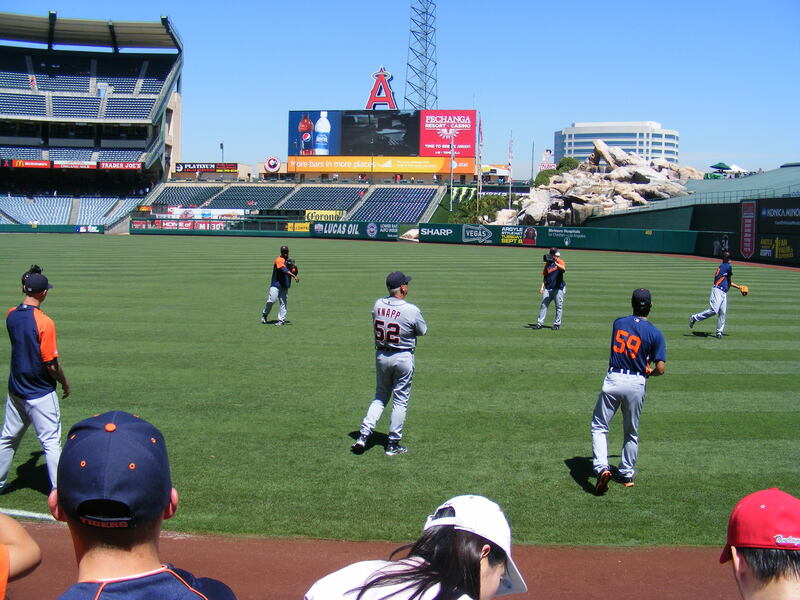 Virtually the whole team was out there–and a few of the coaches were near the dugout playing catch, too. As I knew the coaches would finish first, I got the approval of an usher to head over there to ask for a ball. A few moments later I got my first baseball of the season tossed to me by an A’s coach–not sure who–but it wasn’t Chili Davis, Mike Gallego, Bob Melvin, Tye Waller, or Chip Hale. So that leaves Rick Rodriguez, Chris Pittaro, and Curt Young. I’m going to go with Rick Rodriguez. So, thanks, Rick! He tossed it to me a it skipped off the roof of the dugout. I bobbled it to my feet and then quickly snatched it up. I’d say that is about as close to an error as I want to get all season long. As the players finished up their throwing and began to make their way to the cage I got baseball #2 on the day from Josh Reddick after he finished playing catch. He lobbed the standard Selig my way in the second row of Section 128. Eric Sogard (who has been on the A’s roster for three years but only made the Opening Day starting lineup this season) started signing autographs and I got him on my ticket. My next baseball came my way just a few minutes later as the pitchers finished throwing. Fautino de los Santos hooked me up with a ball in Section 127–I didn’t know who he was at the time but checked through some photos online to confirm it was him. After that I ran up to the pavilion in right field with the hope that the A’s (and their several lefties) would show some pop. It’s clear that’s not what they were planning on this day, however, as only about four or five home runs came nearby–and I was out of range on all of them. I did manage to get a brand new pearl of a baseball from Tyson Ross while I was standing in the third row of Section 239… and then the A’s finished hitting at 6:12pm… much earlier than I’d expected. 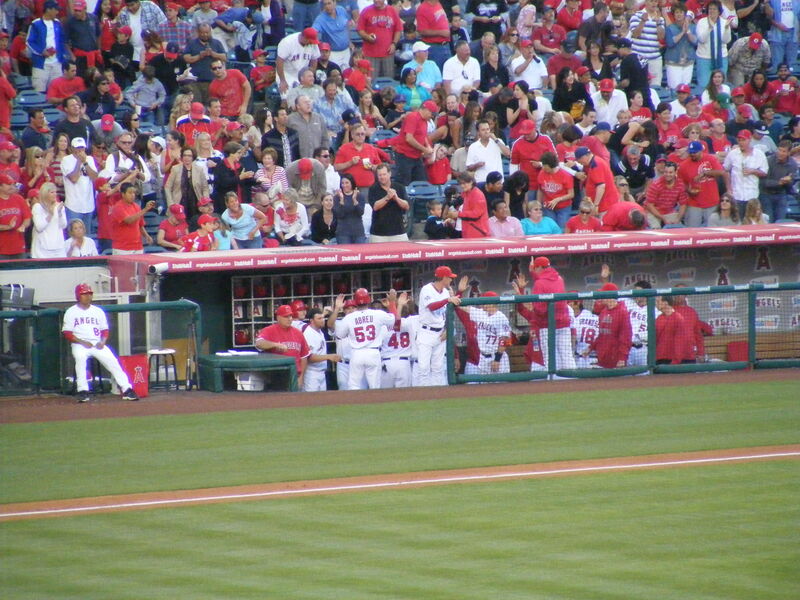 I wasn’t able to get to their dugout in time so I sat down, made some notes, got some water, and waited for the Angels to take the field. See that aisle with the vendor in the yellow? I was ready to jump up and run down it with each pitch. 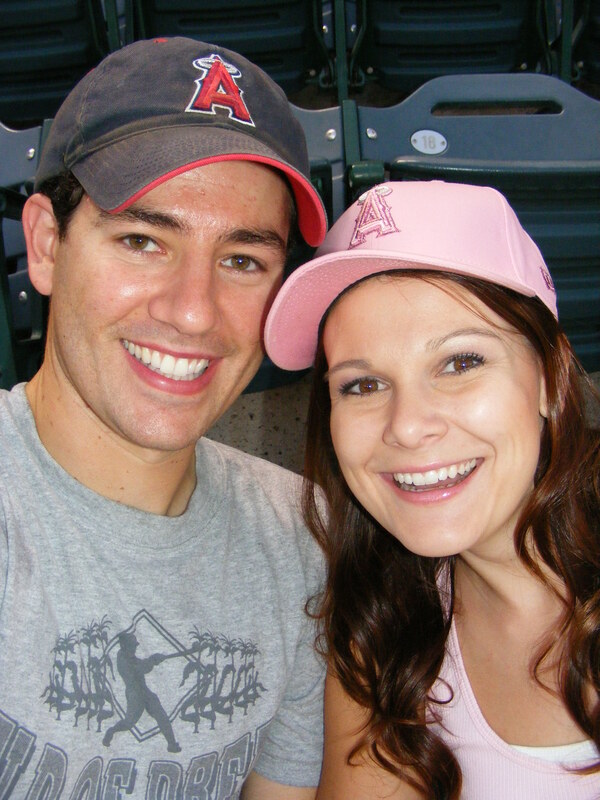 We stayed in the same spot throughout the game, chatted, ate food that we’d brought into the park (I’m so glad the Angels still let you do that), and watched the action. Kendrys Morales hit his first home run since May of 2010–a three run shot that just barely cleared the fence in left-center. 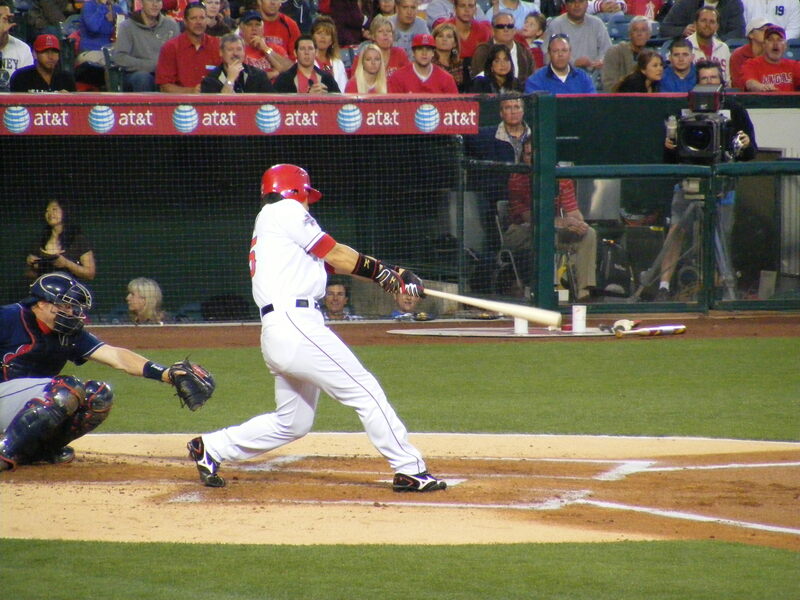 Albert hit a drive to the warning track… but didn’t go yard. The A’s just couldn’t muster any kind of rally. 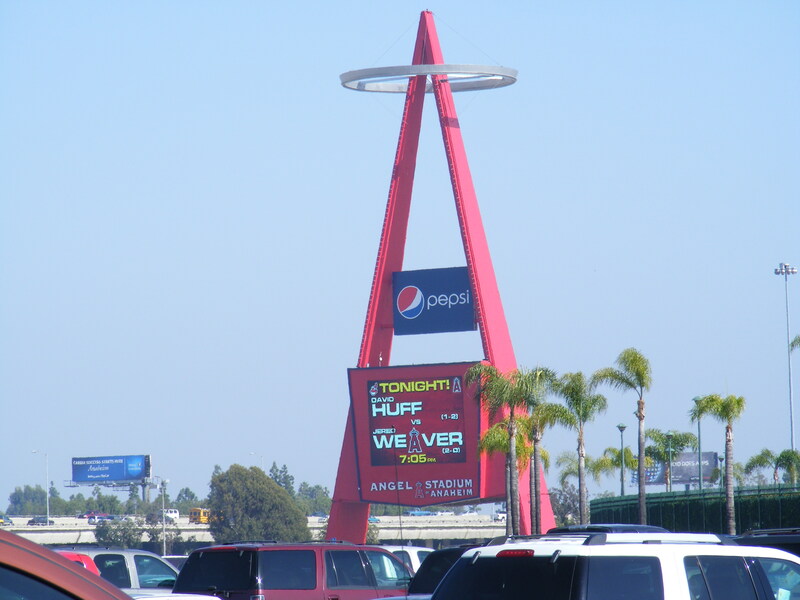 We got to see a pretty cool moment: Jered Weaver’s 1,000th career strikeout. It was Josh Reddick in the sixth inning, in case you were curious. After having not scored since that Morales homer in the first inning, the Angels were able to put up three more runs in the eighth. The healthy 6-0 lead was plenty for Weaver, who was excellent yet again and went six and two-thirds innings, and three relievers. Michelle had to leave around 9:15 to head home so I walked her to the gate and we parted ways (it was still only 3-0 when she left). I returned to the seating area, stayed in the outfield seats for a bit longer but then decided to move. 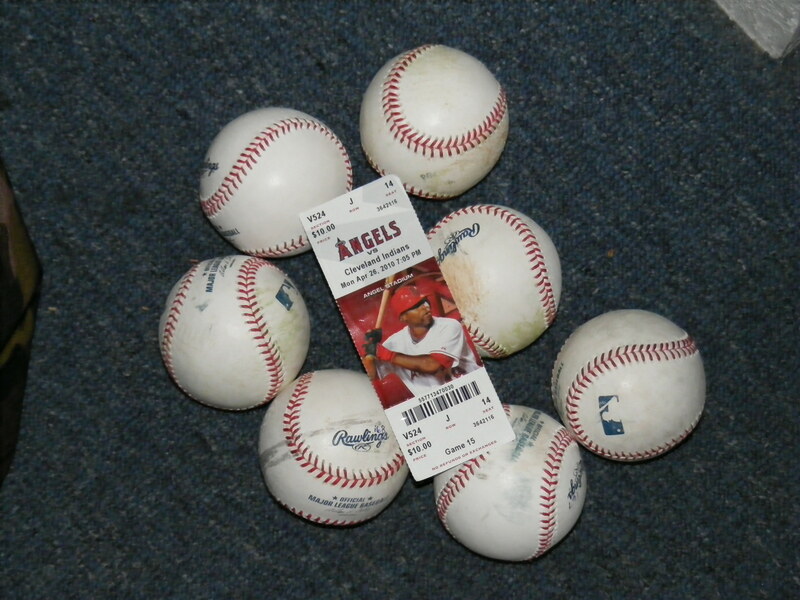 After a half-inning behind the Halo dugout, I ended up behind the Oakland dugout for conclusion of that evening’s contest: And when Erick Aybar grounded out to first baseman Daric Barton to end the 8th, I was about five rows back and he lofted me ball #5 on the evening. I looked closely at it and realized he must have kept the gamer and tossed my the infield warm up ball because it was pretty beaten up. LaTroy Hawkins came in for the ninth inning and, though he loaded the bases, closed out the game with the shutout in tact. And I snapped photos of all the guys on defense, including the one below that I really like of Pujols and Kendrick ready for a pitch to be delivered… Kendrick’s on his toes with anticipation. I asked manager Bob Melvin for his lineup cards but he ignored me… and the A’s relievers came in from the bullpen and Brian Fuentes had a baseball in his pocket. I shouted to him, “Hey, Brian, could you toss me a baseball, please?” He got a few steps closer, lobbed one my way… and a female A’s fan to my right leaned out and nabbed it just an inch in front of my glove. Wow–I guess I should have been more aggressive. I was a little bummed about that one but I was pretty pleased with my haul. I ended up giving away the de los Santos ball to an usher who said she’d be certain to find a deserving youngster to give it to… and I headed home. 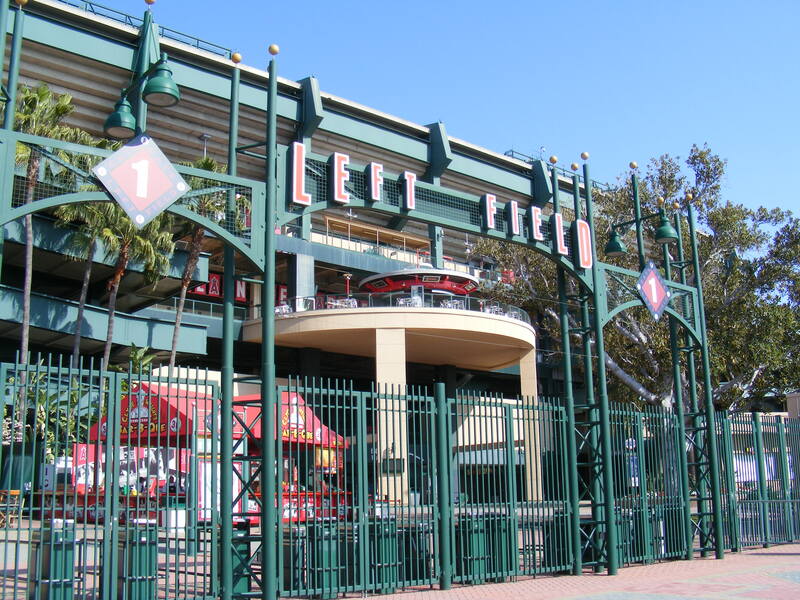 I’d be heading back to see the O’s and Angels on Friday. 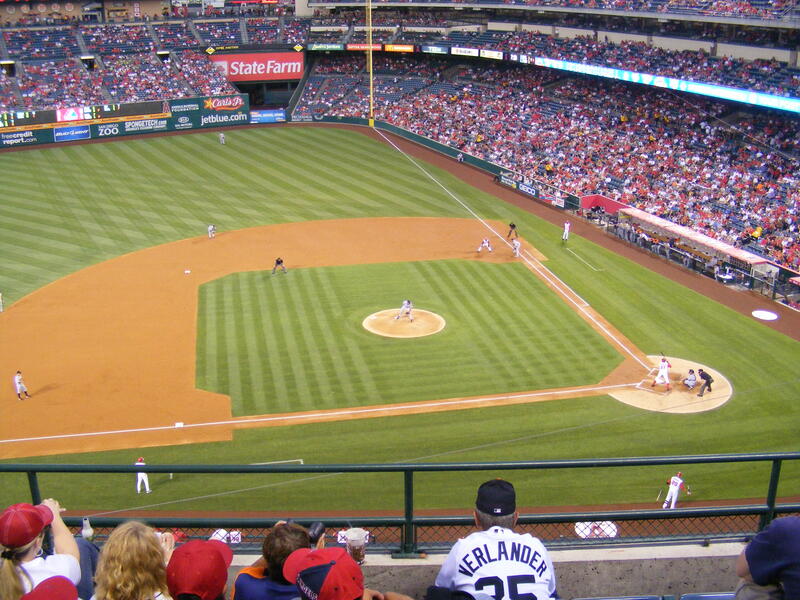 It was a Saturday–Michelle had to work that evening–I wanted to go to a ball game. Luckily, my uncle called me to say that he had four tickets to that evening’s Angels/Mariners game. Then he asked, did I want two of them? Score! I got the family discount–Stubhub! can’t provide that! So, after picking up the tickets I drove to the stadium and met Chris at the gates–he was using the second ticket. We headed in and I took off for right field. I know the photo’s a bit dark bit it was a nice 50th ball with just one scuff on it… below the logo. In case you’re wondering what that number on my palm means, I wrote ‘340’ so that I would remember the next ball I snagged was my 340th ball. So a poor outing (from a snagging standpoint) got a little bit better. I went to sit behind the Angel dugout for the first inning and sent my wife a picture message that said: I wonder how long I’ll get to stay here. Well, he’d just stolen second… Aybar is making sure to keep a tag on Ichi while, I believe, the ball is getting switched out since it was scuffed and would no longer be usable in the game. My uncle Ivar is the man responsible for me being as big a baseball fan as I am–he started taking me to games when I was a little kid (and they were still called the California Angels). And during the top of the sixth I told them I would be going on a brief walk. 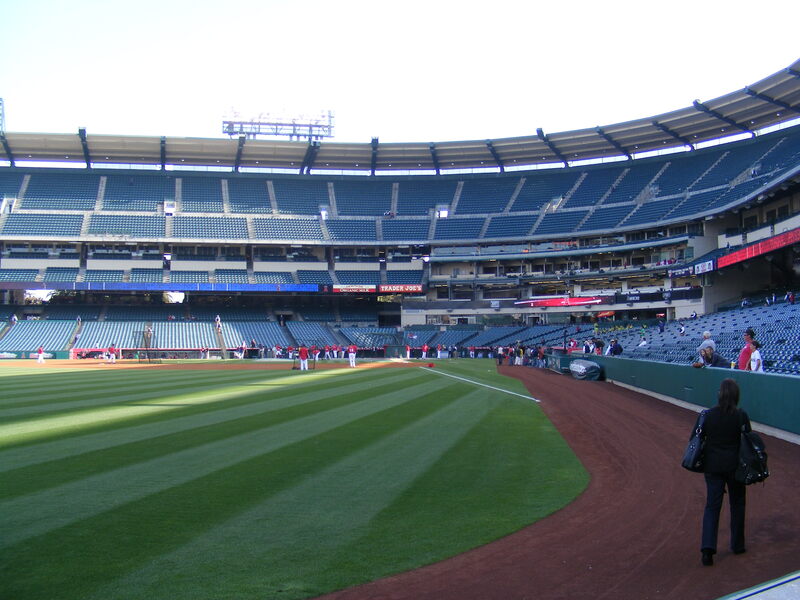 I walked down to the Angel dugout and took a seat about fifteen rows back. And when Franklin Gutierrez hit a grounder to second baseman Howie Kendrick, Kendrick fired the ball to Mark Trumbo at first for the final out of the frame. And when Trumbo got near the foul line I waved my arms and called out to him from about six or seven rows back and he threw me the gamer. Nice! The night ended up being just fine from a snagging perspective. And League was pretty efficient. He got Vernon Wells to pop out. 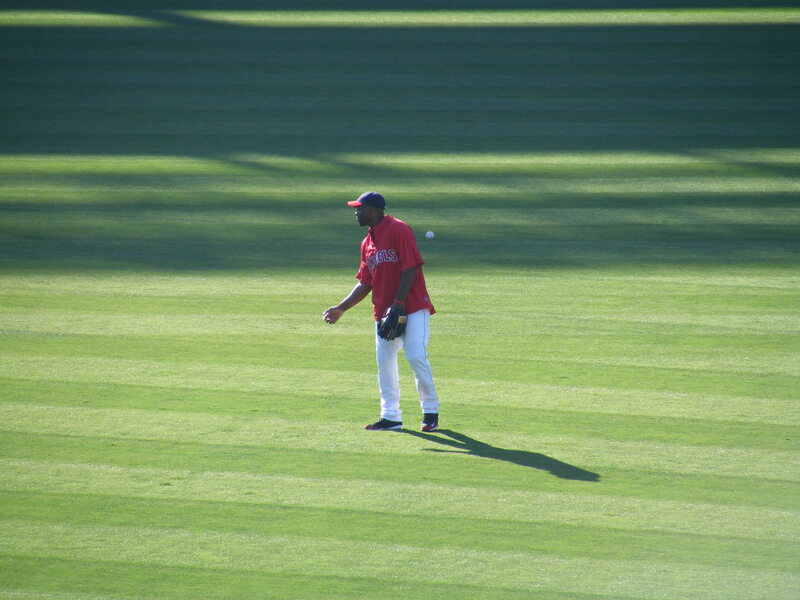 Then walked Howie Kendrick. I hung around for the postgame interview as Beavan (who’s 6′ 7″) got interviewed and the relievers walked in from the bullpen. I didn’t get anything tossed to me though except for a few pieces of bubble gum. A little later, once the stage was set up, assembled, and folks were let onto the infield dirt, Ludacris emerged from the visitor’s dugout and played an hour-long set. There were over 42,000 in attendance for the game and I’d say at least 25,000 stuck around for the concert. Some of the M’s were in the dugout watching… including Adam Kennedy–who then walked onto the field in street clothes with his kid and disappeared into the crowd (he came back a little later). I left before Ludacris finished to beat the traffic out of the parking lot. After more than two weeks since my last game I was pretty anxious about getting out to Angel Stadium again, this time to watch them take on the (ugh) first place (double-ugh) Rangers. Adding to my anxiety was the fact that I didn’t actually have my ticket in my hand as I approached the gates prior to their opening at 4:05pm. You see, about a month prior to this game I donated blood through the Red Cross at one of their blood drives (I’m O+, in case you’re wondering). 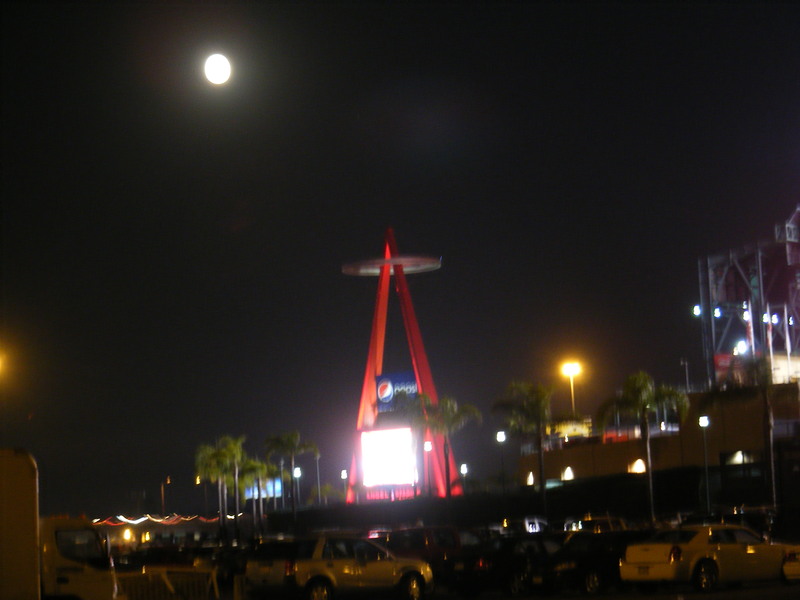 There was an Angels/Dodgers tie-in and, long story short, I received a voucher for two free tickets to the game on this night. The tricky thing was that I had to exchange the voucher for the tickets and the Red Cross volunteers would be arriving at 4:00. Well, I arrived at 3:30, was first in line, set my bag down, walked across the main plaza to the Red Cross booth, and waited. I also enlisted the help of BP regular, Eli, to help save my spot. At 3:55 I convinced the volunteer to let me redeem my voucher (before her supervisor got there, which was the initial issue she had) and then ran to will call because Michelle would be arriving later in the evening and that was the only way that ticket could be used for someone who wasn’t me… because I was the one who’d donated blood and my name was on the voucher… blah blah blah. Anyway, I did all that and got back into line with minutes to spare–and ran inside at 4:05 to set up shop in the bleachers. The first ten minutes or so of batting practice were great! There were hardly any people around and I snagged the first ball of the night off the bat of Hideki Matsui after he hit a homer that took a bounce in the seats of Section 236. I beat out two other guys who were running for it. Just minutes later I nabbed a Torii Hunter BP homer that flew over my head and took a bounce right back toward me after I’d positioned myself closer to center field. With two baseballs in ten minutes I thought I’d be headed for a record-setting night–but things slowed down after that and the seats began to fill up. That was at about a half hour after the gates had opened. And, I should point out Rob, with his foot on the seat in the middle of the right view photo, who’s got over 800 baseballs (most of them batted balls) to his name. And Skyler, the teenager in the black T-shirt and blue jeans near the usher in the left view photo. He’s an up and coming ballhawk who can be a little wild at times but who’s made some very nice plays in the bleachers. Also, that rather large usher who looks so stern is, in fact, making sure the young fan in the first row doesn’t stand on the seat or sit on the wall. Usually the ushers hang out in the back of the pavilion and let us do our thing during BP–they’re very friendly and professional. Unfortuantely, the Rangers exhibited an uncharacteristic lack of power during BP… except for Vlad who hit a couple shots to the rocks in center… but I didn’t snag another ball during BP. I tried for a toss at the dugout. Nada. Tried for a warmup ball. Nope. 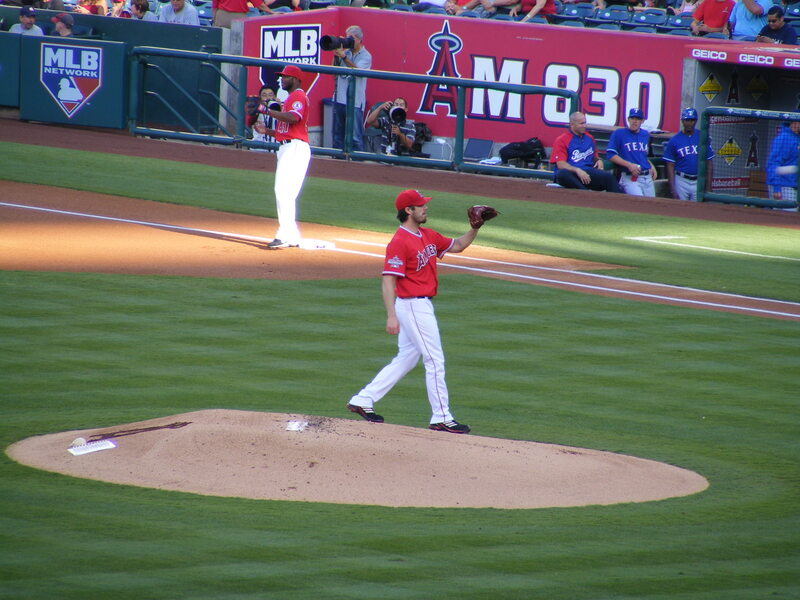 As the game was starting Michelle still hadn’t arrived so I parked myself behind the Angels dugout to watch Dan Haren warm up before his second career outing with the Halos. He did pretty well. I was glad because his first start, against the Red Sox, was going well but then he took a line drive to the arm and left after 4+ innings. He’d go longer today. Once Michelle arrived we grabbed some seats… but then she had to take an urgent phone call from work so I followed her out to the concourse and used the opportunity to take a photo of myself with a commemorative ball from the All-Star Game (earning myself three points in the myGameBalls photo scavenger hunt). We ended up in home run territory. My new goal has been to go for foul balls and home runs during games more than third out tosses. Those have become fairly easy. I’m still only at one foul ball and zero home runs in my life. Hopefully those numbers will improve soon. m the DL. Texas got on the board first, in the fourth inning, when Vlad smacked a two-run home run to left-center field. That was all the scoring the Rangers could do. Not bad, right? Haren went nine innings! 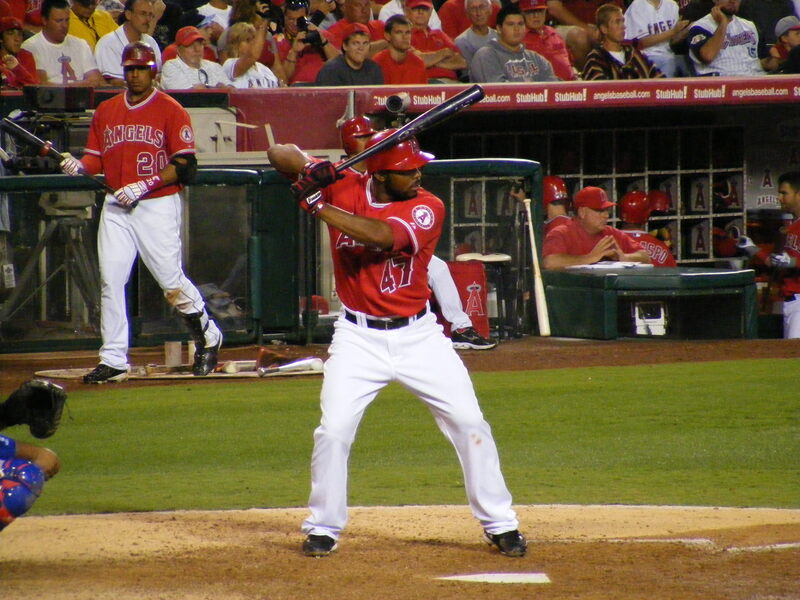 And got the loss… the Angels only scored once–in the seventh on a Howie Kendrick solo homer. I thought we had a chance for a comeback but th ebullpen for the Rangers locked down a victory. Harden threw seven great innings. And the only chance I had at a homer? Well, it was hit right to my section but was about twenty feet shy of the fence–and ending up being a flyout. I went down to the Ranger dugout for the ninth inning (while Michelle watched from the concourse) and watched as Neftali Feliz shut down the Angels. Alberto Callaspo flew out to center and Kendrick and Juan Rivera grounded out. It was a one-two-three ninth and it allowed the Rangers to increase their AL West lead over the Angels. 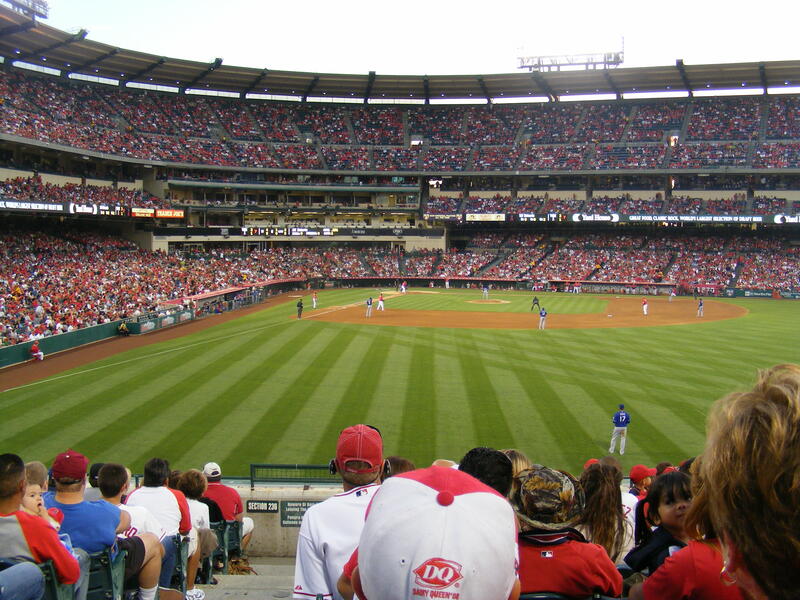 I had decided to avoid the Angels/Dodgers series midweek due to the crowds and instead bought a discounted ticket for me (and one for Michelle) for the Saturday night game against the Colorado Rockies. We left home together at 4:00 and got to the stadium at 4:21. There was no traffic–I’m used to traffic. 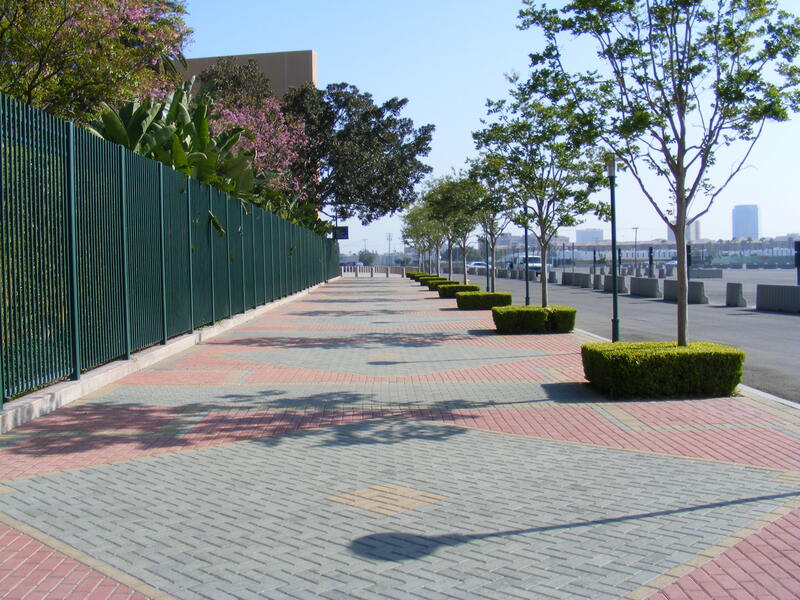 Since we were earlier than expected we walked across the parking lot to the nearby Grove theatre. Why? 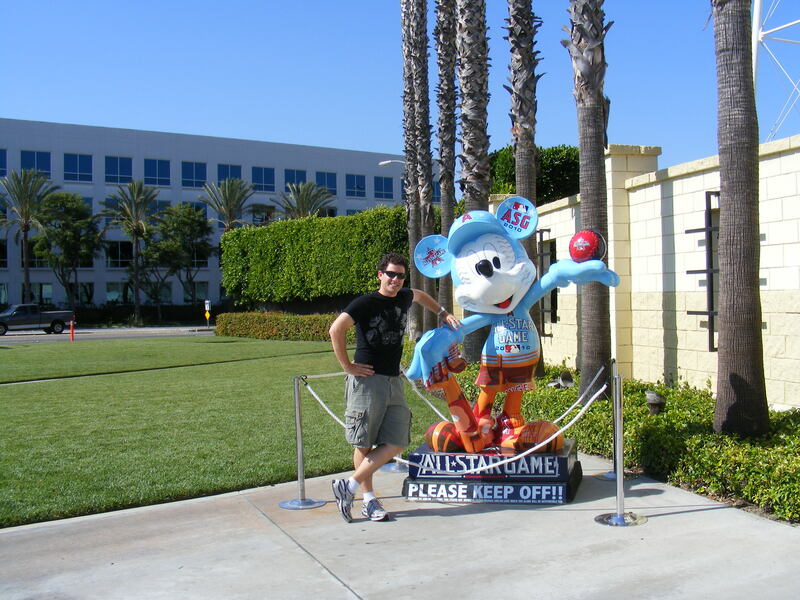 Well, as of a couple weeks ago there are thirty-six Mickey Mouse statues around Southern California. 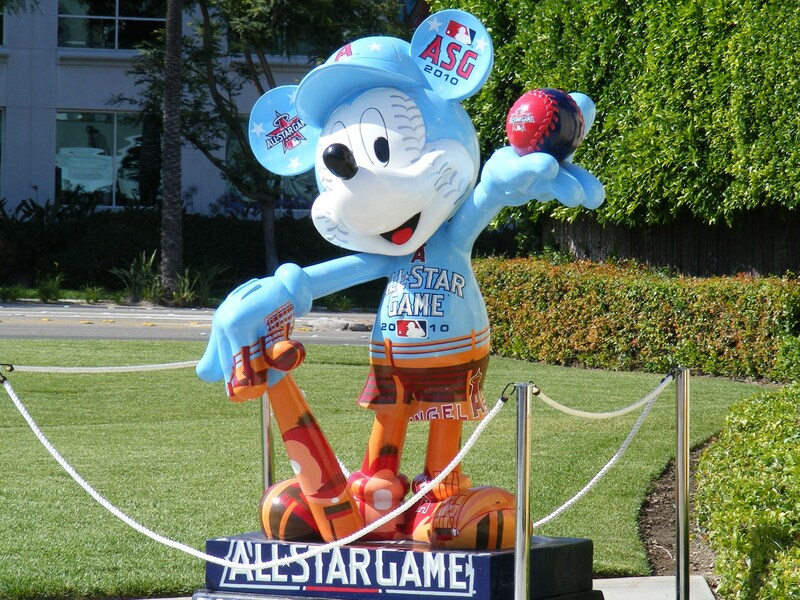 They’re part of the All-Star festivities and there’s one statue for each MLB team, one for the American League, one for the National League, and four All-Star statues. I’d seen a few of them around town but wanted to get a good look at the one at the Grove because I didn’t recognize the paint job on it… I’d driven past it a few times. We got closer and I realized it was All-Star themed. Michelle took a photo of me with the more-than seven-foot-tall rodent. 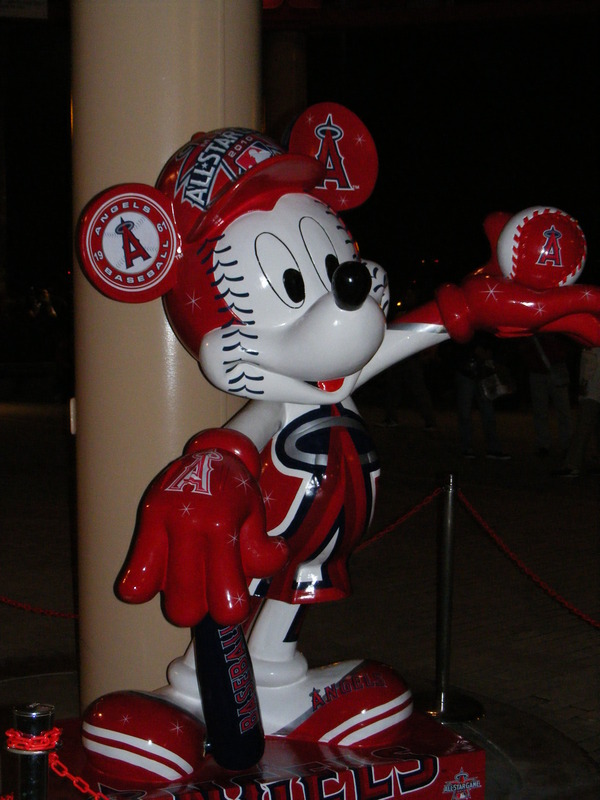 I read later that each statue weighs close to 1,000 pounds… and that the Red Sox one in nearby Santa Ana got whacked… or beat up… by someone. And for Torii Hunter, who’s a righty, I moved closer to center. It’s my usual strategy for the first group of Angels and today it paid off. Hunter launched one to right-center and I lined myself up and made an easy catch in the third row of Section 240. It was great to get on the board with my first homer caught on the fly since (I had to look this up) mid-April. Wow–that’s almost embarrassing. 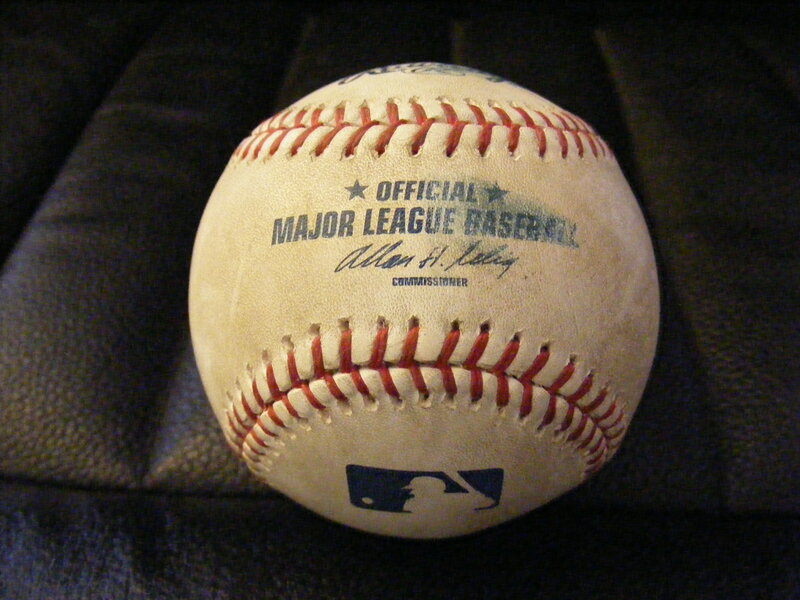 Anyway, I was excited to snag it–and it was a pearl… except for the Practice logo the ball had on it. 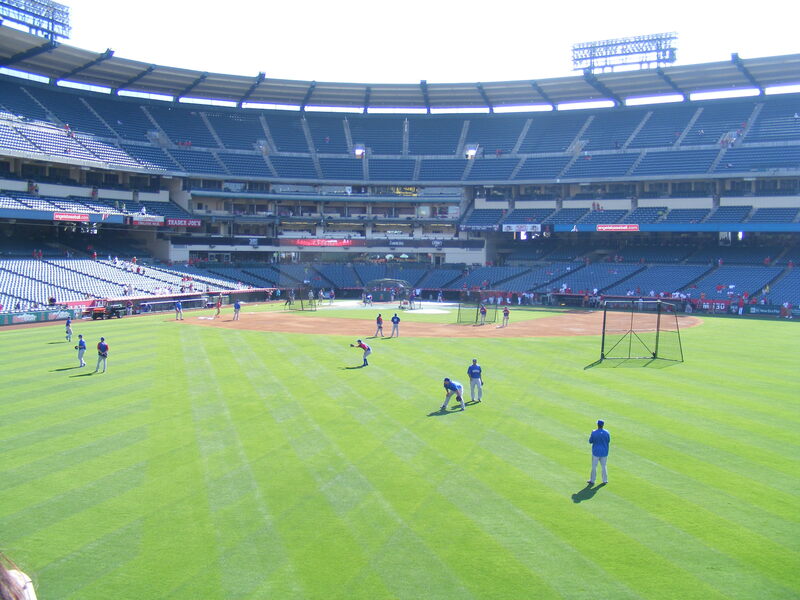 Baseball #2 on the day would come after the first round of Angels BP. Erick Aybar slice a ball to right field and I was hanging out near the foul pole. I was standing at the wall and saw the ball would hit about ten feet to the left of where I was, and where I’d taken the above photo, so I ran over there, jumped up and over and scooped up the ball in one precise move. It was near the guy in the red shirt and hat in the panorama… on the left of the frame. 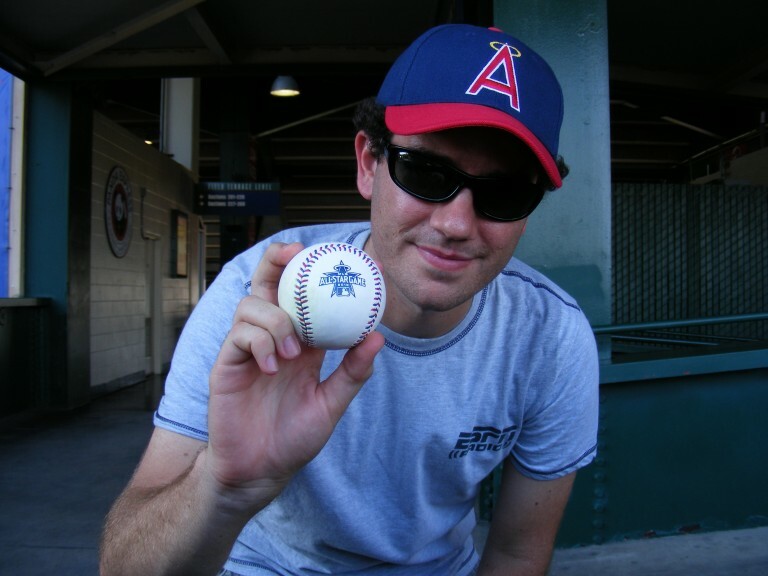 It, too, had a Practice logo… it seemed that the Angels had recently switched to those–in the past their BP balls had been stamped on the sweet spot in black ink with the word PRACTICE… now they’d switched to the official Practice ROMLB. Interesting. The Rockies pitchers came out to warm up a little while later. I got a little wave and greeting from him, too. That’s important. About ten minutes later the pitchers were done throwing and I had returned to the pavilion for some of the powerful lefties on the Rockies. A ball had rolled to the wall and Jimenez had been jogging nearby. As he came to a stop I asked him if I could have the ball–he walked over, recognized me from earlier, and he tossed it right up to me. Many thanks to Ubaldo–and I’m glad the Angels didn’t have to face you in this series. Ball #4 would come toward the end of Rockies BP and it was a tossup from Matt Belisle back near the foul pole in right. Nothin’ too special about it… I would end up giving it away to a young fan later in the evening. More on that later. I ended BP with four baseballs and I was okay with that… Michelle and I grabbed food and took up some seats in the Terrace Level seats just past third base. When the Rockies came out to throw before the game started I decided I’d try to snag another ball… I went down to the front row, just behind the Diamond Field Box on the first base line. Jonathan Herrera was throwing with another player (I forget who it was) but Herrera’s the important one here–he tossed me his baseball as he finished. The fan to my left was really happy for me. uy?” intending to give it away. He showed me the ball he’d gotten already. Can’t say I didn’t try. 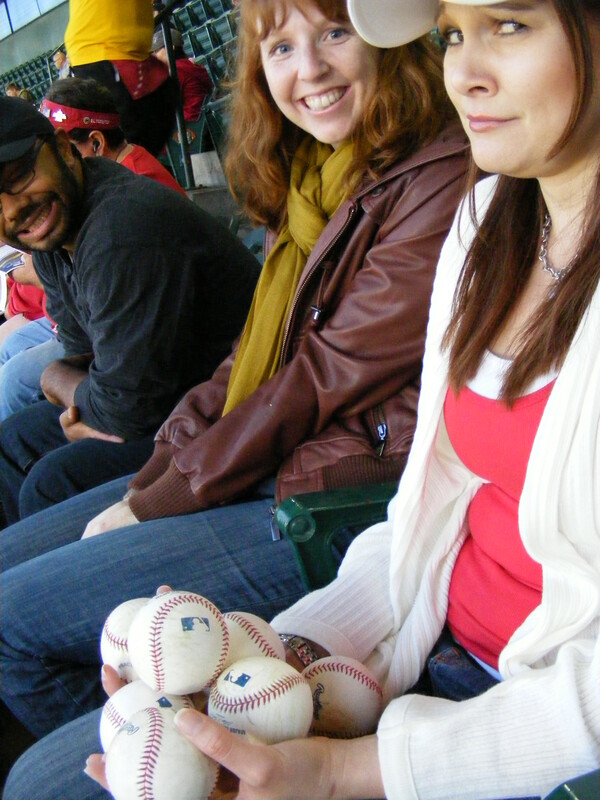 So, I was at six baseballs on the night and at that point I was REALLY okay with just hanging out and enjoying the game with Michelle. At that point I told Michelle that if anyone else hit a home run she should try to get a picture of me as the batter was jogging between 2nd and 3rd base. Well, those four runs were all the Angels would get and the Rockies started a comeback in the third inning when Clint Barmes hit a solo shot. I think it should count. Barmes is just touching third in that pic… so his left leg is still between 2nd and 3rd, right? It was a fun, goofy kind of night. muster against starter Joe Saunders. 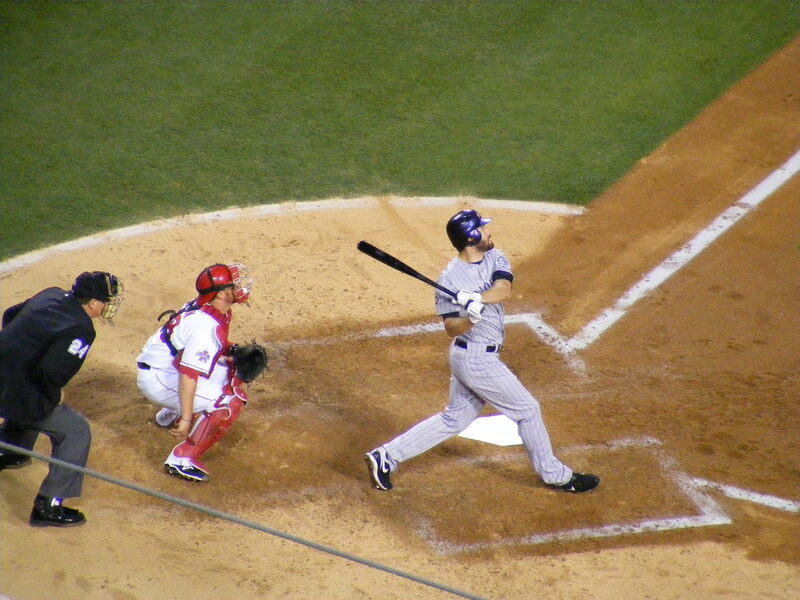 Seth Smith hitting a fly ball on the left. Clint Barmes about to foul one off on the right. 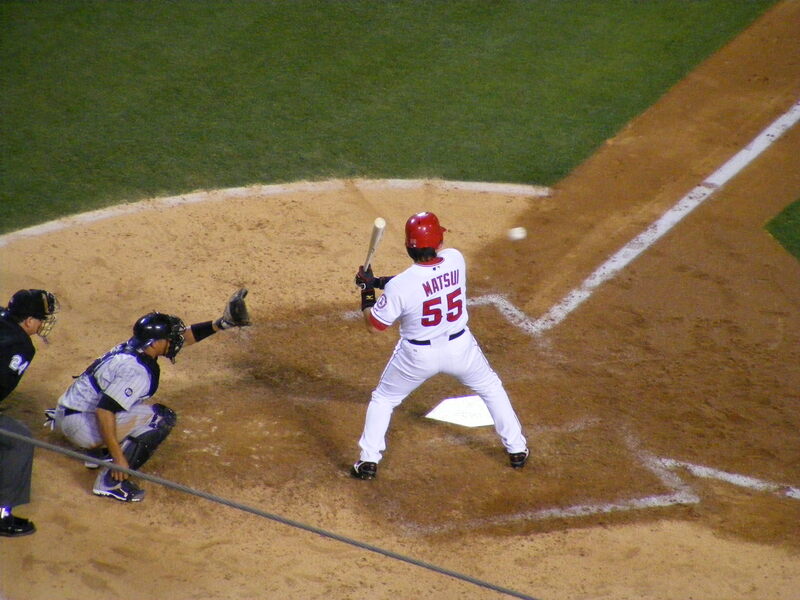 Jonathan Herrera pulling the bunt attempt back. Hideki Matsui avoiding a pitch up and in. Saunders went seven innings… Fernando Rodney and Brian Fuentes each pitched a scoreless inning and the final was 4-2. 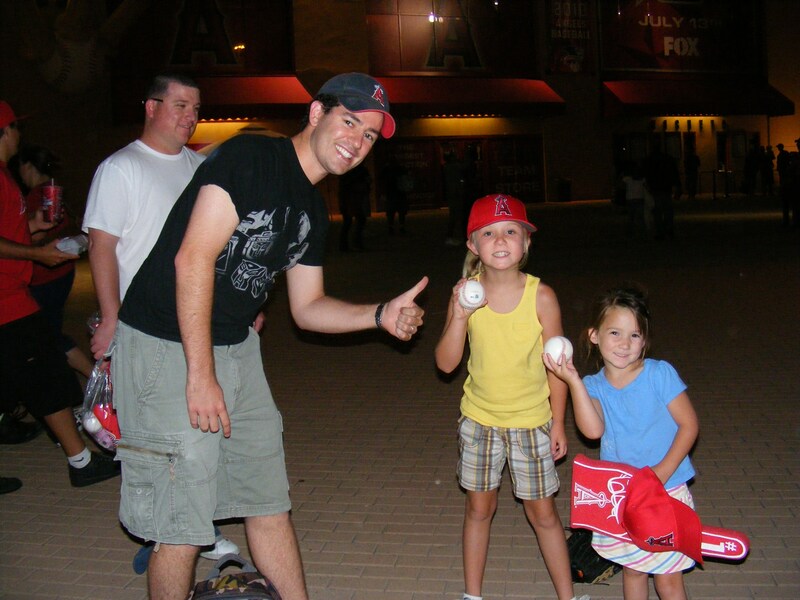 And one last thing… I had decide to score a few more points in the scavenger hunt as I gave away two baseballs to a pair of young sisters. The older sister would be celebrating her birthday the next day, I found out. As families were leaving the stadium I was looking for a little kid with a glove. Their dad is standing behind me in the white shirt. Man, my farmer’s tan is in full swing–yikes! 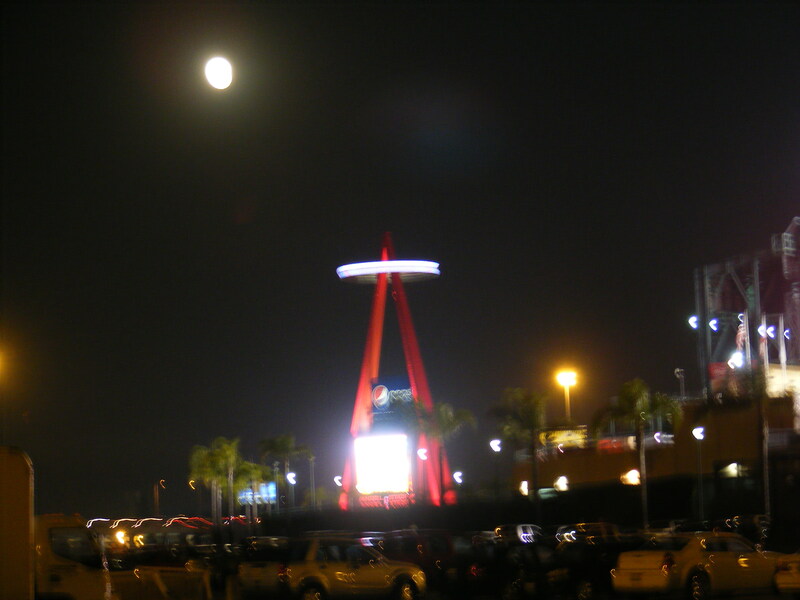 The whole family went off totally excited, the Angels had won, I’d gotten some great photos. It was an awesome night. Michelle and I celebrated with frozen yogurt. Delicious. The Indians were in town for a few days and, since my friend Randy (who I’ve mentioned in blogs before) is always down for the Tribe, I was heading to the game and Michelle, Randy, and his girlfriend, Beth, would meet me there a little after 7:00. And a panorama of the stadium taken from the parking lot. 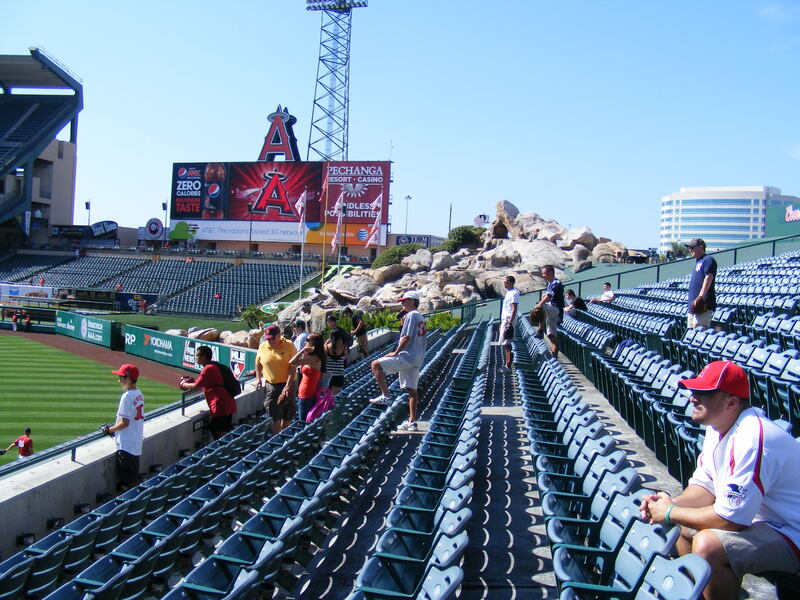 I still think that Angel Stadium is one of the best stadiums to visit. It’s clean, the employees are friendly, and it’s affordable. Plus, the Angels are a great team! I was the first one in my line. A few minutes later BP regulars John, Chris, and Rob showed up. John and I played catch for a few minutes and we all talked strategy for the day. 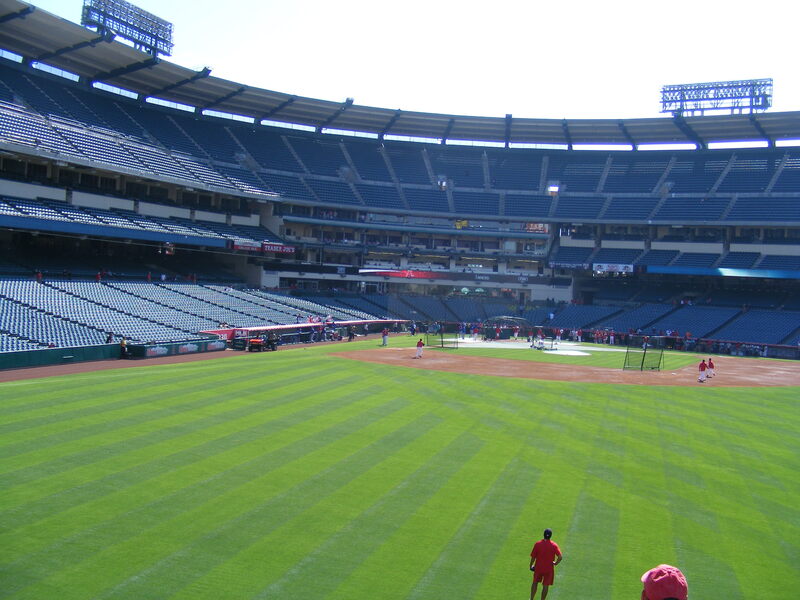 My plan was to head straight in to left field since the Angels would be facing a lefty. All their switch hitters would be batting from the right side… I was the only one of the four of us that wanted to head that way. Cool, no competition. The pavilion in left field is separated from the playing area by both teams’ bullpens so not a lot of homers (even in BP) go up there. “I saw it get hit when I was way over there,” I said, gesturing. A second later another home run landed in the seats above us and bounced right to Terry. My backpack! 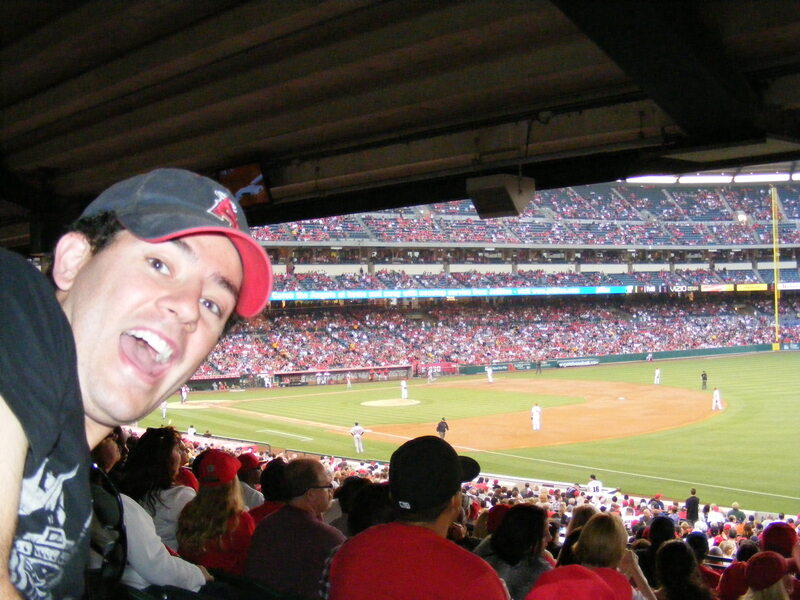 I ran back to the lower seats, deposited the ball, the 167th in my life, and went back to my hobby–snaggin’ baseballs. 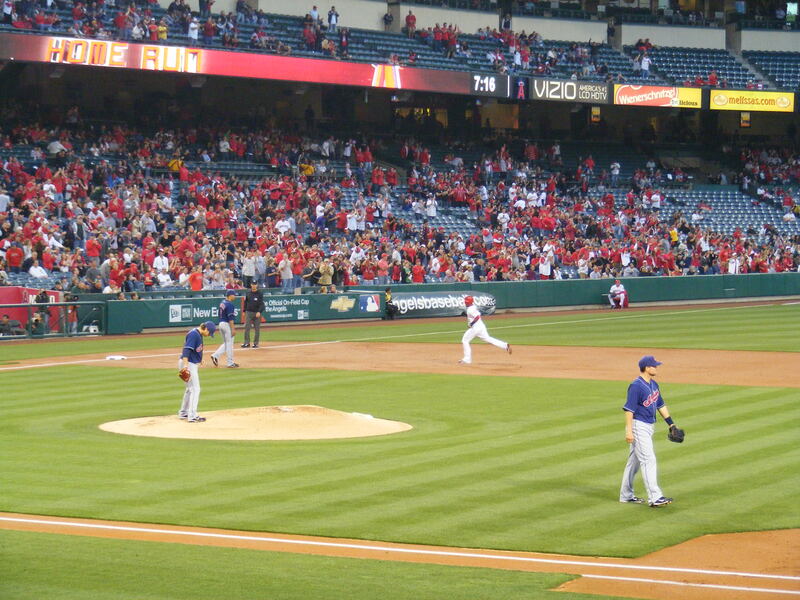 Some Angels pitchers were nearby and after a little while Scott Kazmir fielded one and hung onto it. He still had it a few minutes later so I yelled out, “Hey, Scott, could you thrown one over here, please?” I stepped back away from the wall… he held the ball up and fired it from forty feet away–over the heads of the folks in front of me–and I had my second baseball of the day. I’d previously missed out on a screamer down the line because the guy near me saw my reaction and jumped up, hung over the wall, and snagged it first. But after I’d labeled the Kazmir ball another one came dribbling out to the track. It was moving pretty slowly and was an easy grab for Ball #3. 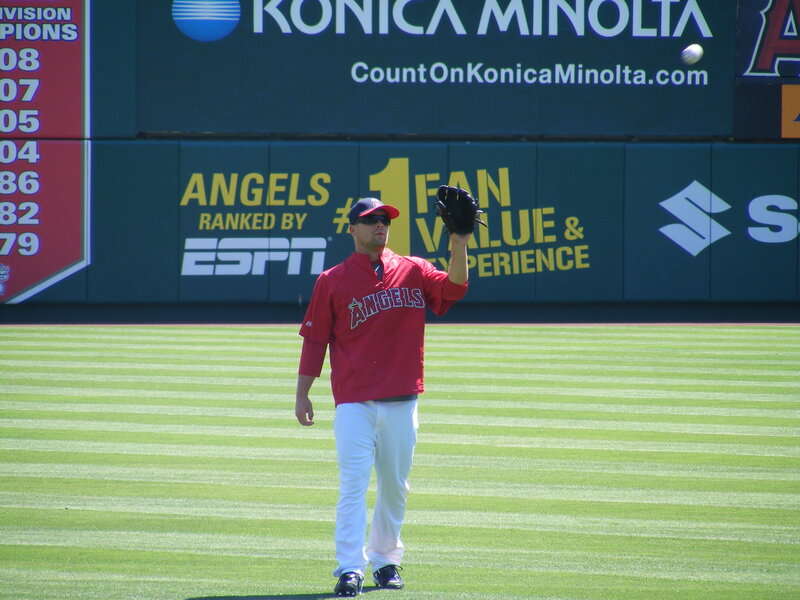 That was it for the Angels portion of BP, though Rob had come over to left field by that point as well and I watched a ground rule double go a few feet over my head and Rob ran, leaped, and snagged it for a cool catch of his own. We both headed to right field when the Indians started hitting–they’ve got some lefties that can really smash the ball! up the stairs and–just missed making the catch. I was still able to grab the ball as it rolled across the concrete nearby. Five! But despite quite a few more homers, I couldn’t get close to any of them and at 6:15 I ran down to the first base line and waited for BP to end. It did and both Chris and I ran toward the dugout. I was near the home plate end of the dugout as the Indians trotted in and someone threw me number six on the day. I never saw the player or coach’s face. Just the arm after I pointed to my Indians cap as he headed into the dugout. Michelle, Beth, and Randy still hadn’t arrived so I made myself comfortable in the seats near the dugout. 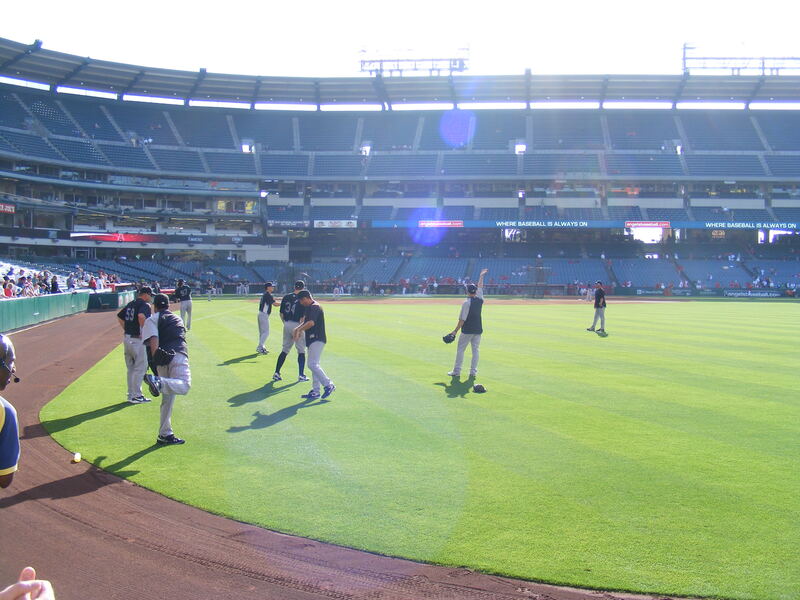 Eventually the Indians came out to warm up. In the bottom of the first Michelle called me to say they’d arrived. I waited until the inning ended, tried for a third out toss from Russell Brayan, I let the kid in front of me get it even though I’m prety sure it was meant for me… but I didn’t want to fall on the little dude… and then I met them at our seats on the 500 level. I showed them. Can you tell my wife was impressed? Michelle and I have both been working a lot and it would be so great to have some relaxing time at the ball game. So, for a while at least, I put catching baseballs out of my mind so we could just enjoy the game. But first, food. They were all hungry so Randy and I bought refreshments–hot dogs, sausages, Chinese food, drinks–oh, yeah! It took a while but it was all delicious and we all hung out in Section 524 for most of the game. 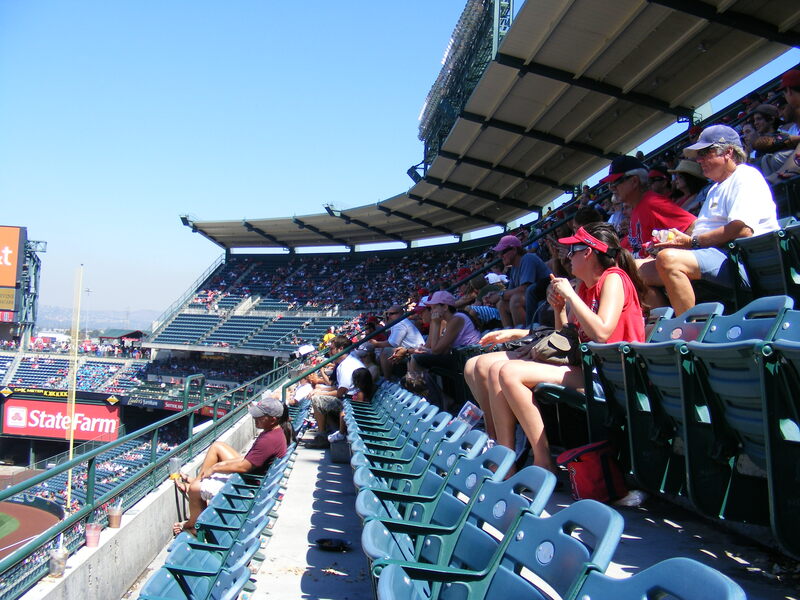 It was a light crowd (not surprising–a Monday against the Indians) which, at Angel Stadium, means 35,000 or so. The seats I gotten were through eBay for six bucks each and I sure couldn’t complain. I love eBay. “Makes Me Nervous” Fuentes was called in to close it out. 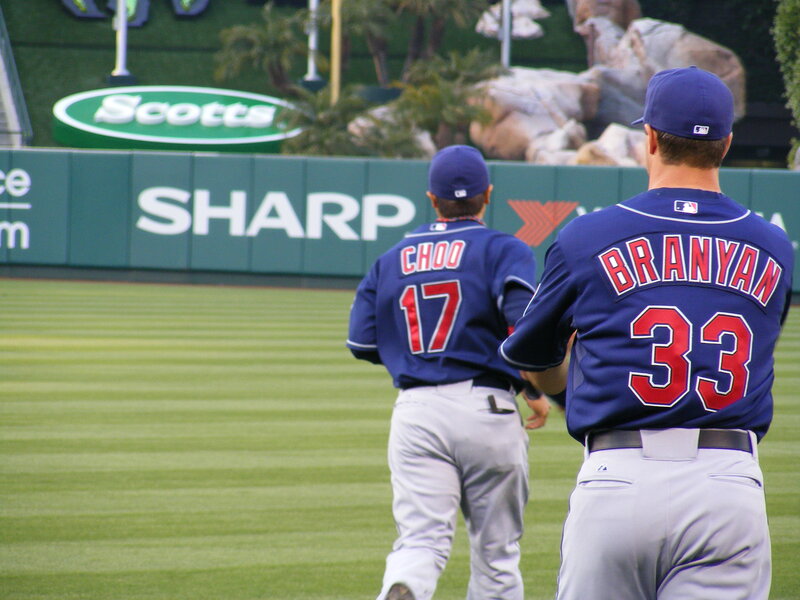 Fuentes struck out Choo leading off the inning, then Travis Hafner reached first on a throwing error by Brandon Wood. 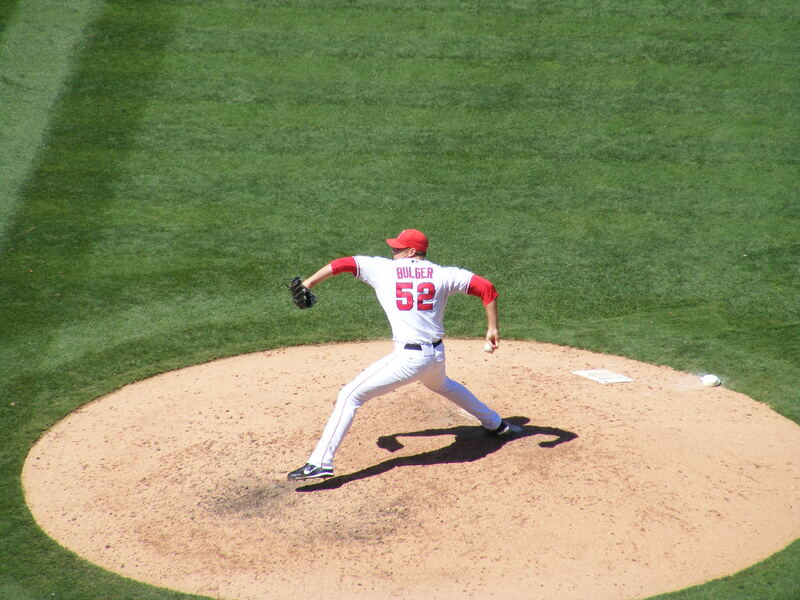 Fuentes struck out Branyan, then walked Kearns… yikes. 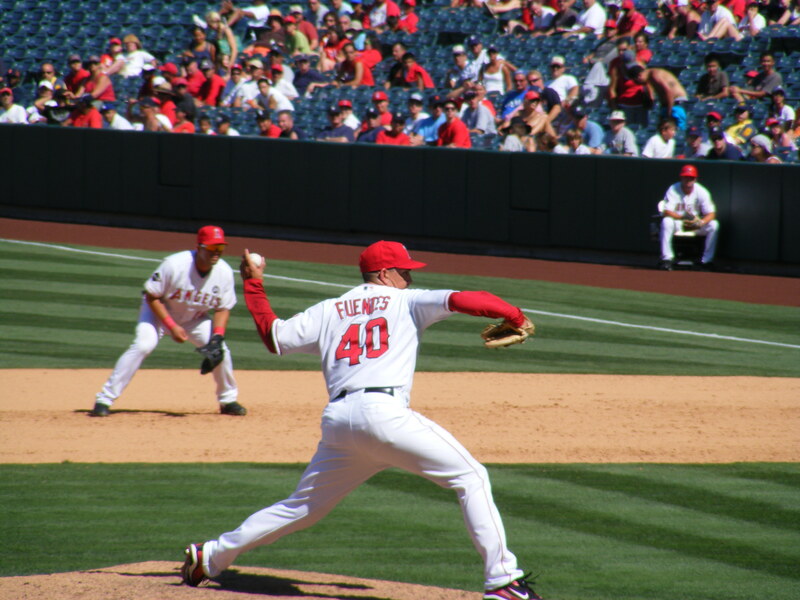 Finally, Fuentes struck out Jhonny Peralta to end it. Whew. Not pretty–but he struck out the side. Predictably, the Indians didn’t toss anything up at their dugout and we all made our way out to the parking lot. Michelle and I parted ways with Beth and Randy but first we all posed for a picture. 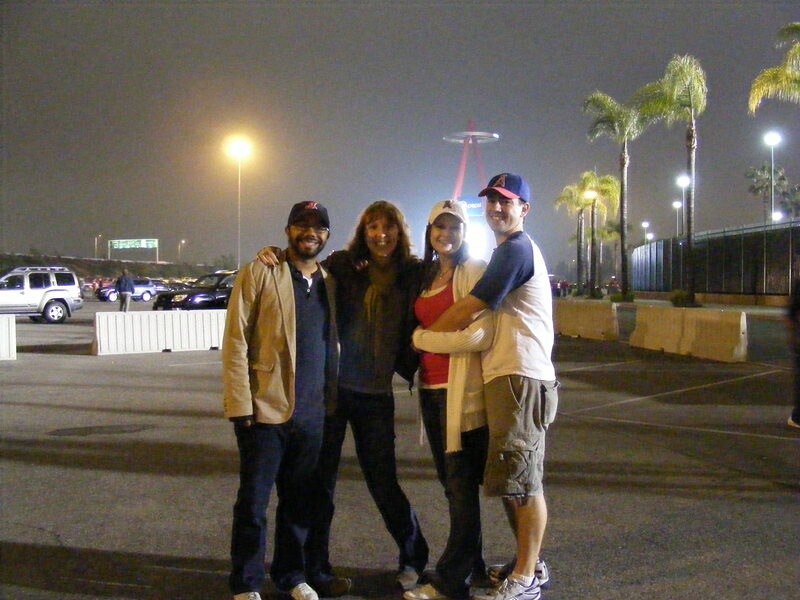 It was a great game, a fun time, and the Angels won! So I was ecstatic. A day game after a night game on a Wednesday. 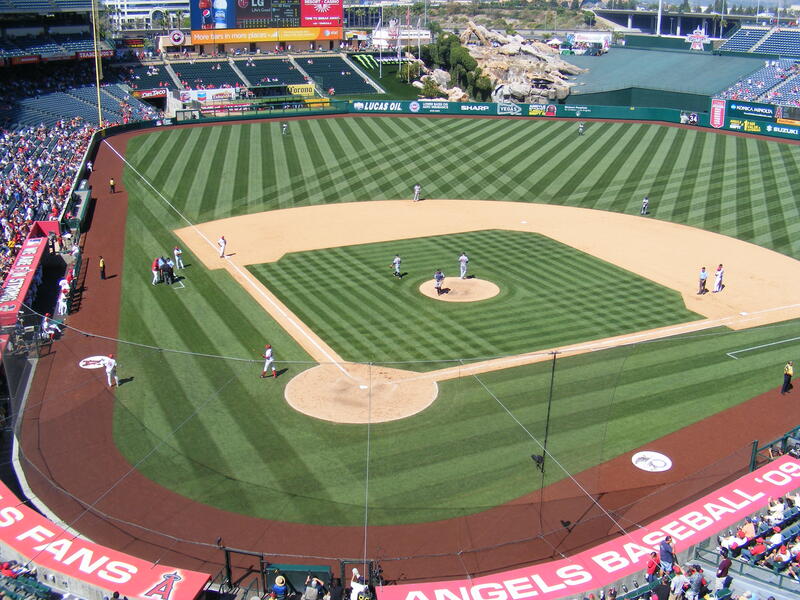 Angel Stadium. August 26th, 2009. It was an important day for me. I’m glad that I had my wife and a friend of ours there with me. visiting team had been out first at the last day game I’d attended. the field, so what did I do? now? Certainly he wasn’t serious… I couldn’t go down to the field. So, I held my glove up and made a throwing motion with my right hand. I write the name of the player who’s autograph I get on the back of the ticket along with the date so I can remember… see it up there? Then I got Rafael Rodriguez to sign another ticket. I couldn’t get a baseball from Trevor after three interactions with him, including this last one when I asked him for the ball he’d just finished using. 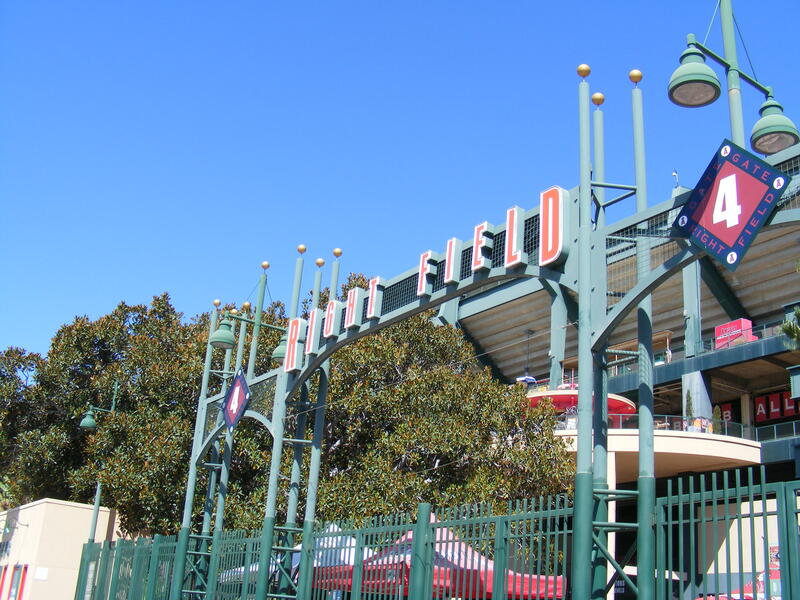 Strike three–I was out of there and across the stadium. I got down to the foul line on the Field Level and saw a small crowd there that included the aforementioned John Witt. Justin Verlander, who’d pitched well on Monday night, was signing autographs and since I had already used up three ticket stubs I had I grabbed my silver Sharpie and got him to sign my Tigers cap! Sweet! After that Fernando Rodney was still throwing with Ryan Perry. Rodney overthrew the ball and I jumped for it. It ended up going just over my head… and an older guy behind me caught it. He asked me if I’d seen the catch and when I said yes he pulled out a tape recorder. As it turns out, he worked for a Detroit radio station… who knows, maybe I’m on the radio somewhere in D-Town. I took the autographed ball back to Michelle and left it with her while I tried to nab another ball from Bobby Seay. I got denied… but the game would be starting soon so we headed up to the 400 level. It was a great summer afternoon. It was warm but, man, I love day baseball games. It’s just a different environment. I don’t like the lack of BP but I love the many, many empty seats. Torii Hunter started off the Halo offense with a two-run homer in the first inning that just got out of the reach of Curtis Granderson at the wall. The Angels tacked on a run in the third and another in the fourth. Joe Saunders was pitching against Edwin Jackson and did well in his first start back from the DL. He went five innings and gave up two runs… the bullpen shut it down after that. But let’s pause for a moent and talk about the sixth inning. As the top of the sixth arrived the row in front of where we were sitting had cleared out due to the lack of shade as the sun traveled through the afternoon sky. I looked over at Michelle and said, “I’m gonna move down there a bit. I’ve got a good feeling.” So, I sat in the sun on a hot seat while Jason Bulger (who I knew could throw hard) got Placido Polanco to fly out. And it turned out that I needed all the space in that empty row. 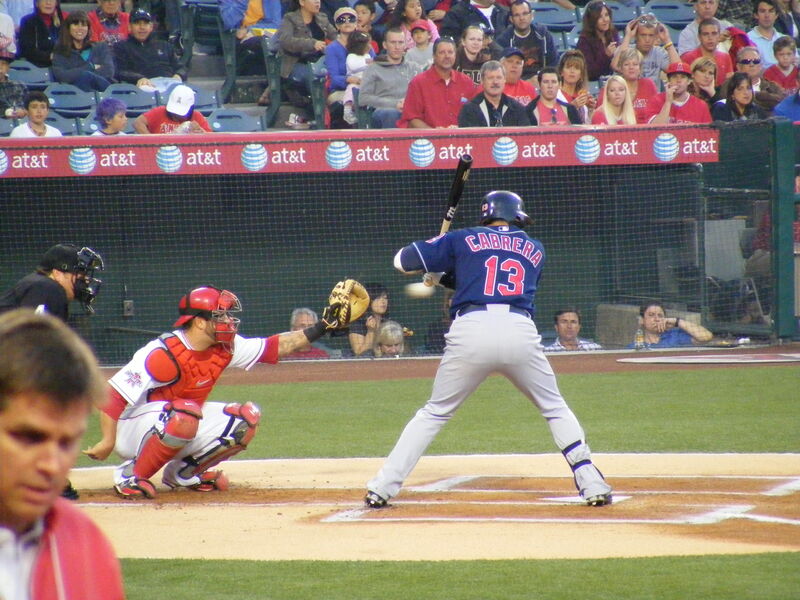 Bulger threw a fastball and Cabrera was just a bit late on it. It came flying back toward me, arching toward the seats. 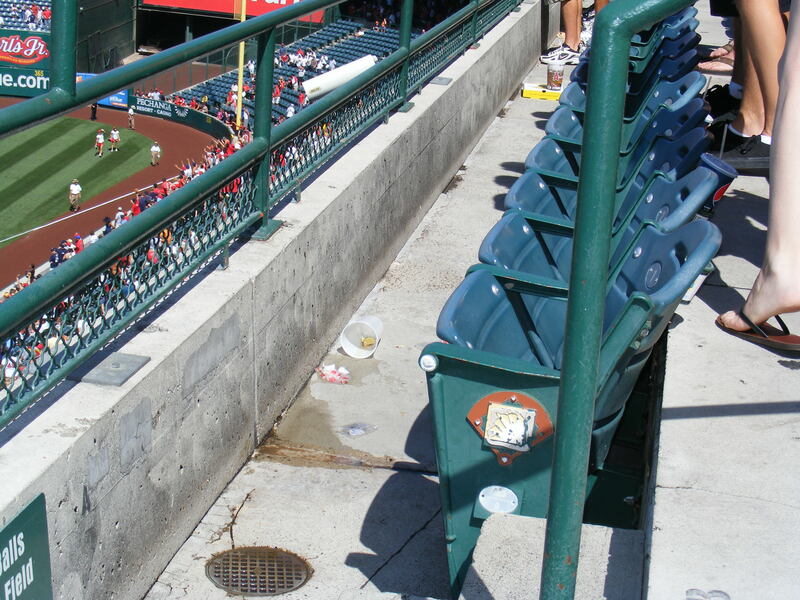 I knew it was going to get up to us… I took off to my right along the empty row and I got to the green handrail at the staircase just as a fan stood up to catch the ball (bare-handed) up in the fourth row. It bounced off his hands, and since I know that gravity pulls things down (duh) I got right below him in the first row (right at the bottom of the staircase). The ball hit off a second fan’s hand and spun down into the first row near where I was standing. I was facing away from the field (that photo shows the view to my left, where the ball ended up). I lunged to my left, reaching out with my glove hand (since the ball was still rolling). All of a sudden I felt weight on my right shoulder… a lot of weight. Later, I found out that a guy had tripped going for the ball and had fallen on me. 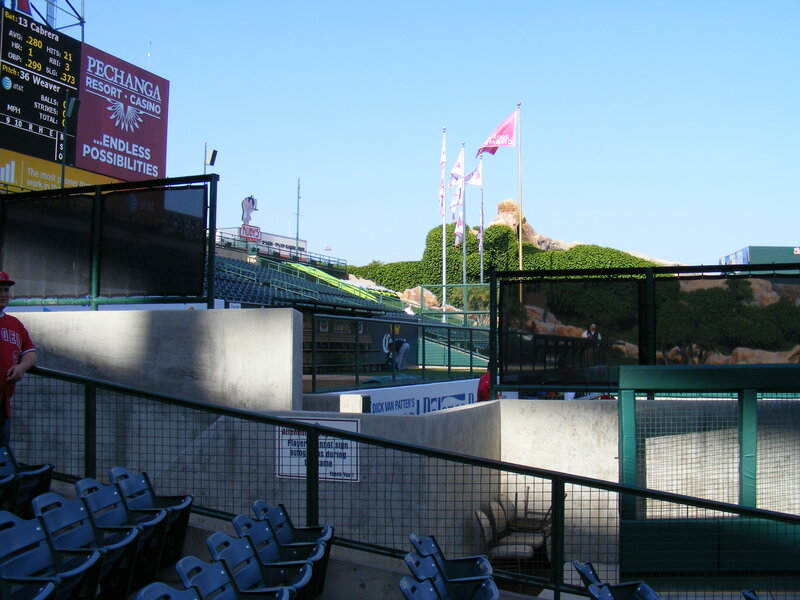 I braced myself against the concrete wall with my left arm (sticking my glove into that wet spot in the process… ew), scraping it against the concrete wall, and stretched out my right hand to grab the ball. My first foul ball. Ever! Yes! I was thilled. Every one of my ninety-eight baseballs in my collection had been BP/warmup/3rd out/postgame baseballs. 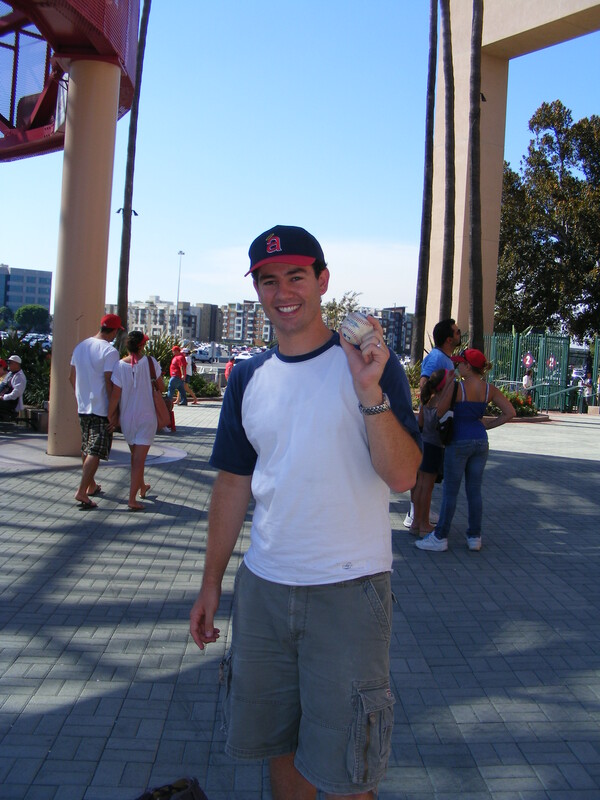 This one was my first live game ball. Man, I couldn’t believe it! I’m excited about it even now as I’m writing this. Woo! Fuentes got the third out and I lined up with about twenty other people hoping to get a toss up. A few baseballs came up but I didn’t snag anything… that was all right with me though. 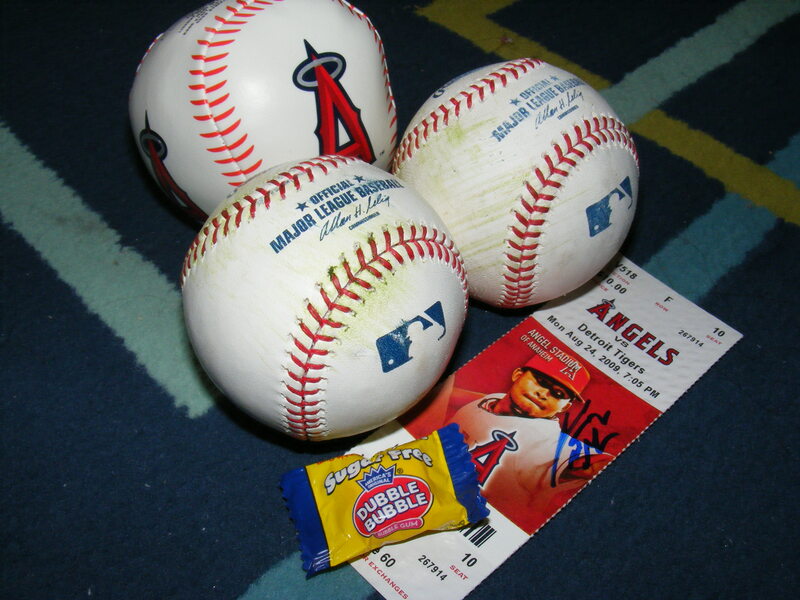 I grabbed a few ticket stubs and an abandoned Angels Magazine on my way out to meet Michelle and Toby. I ended the day with five autographs, two baseballs, and a great memory of a milestone in my ballhawking career. 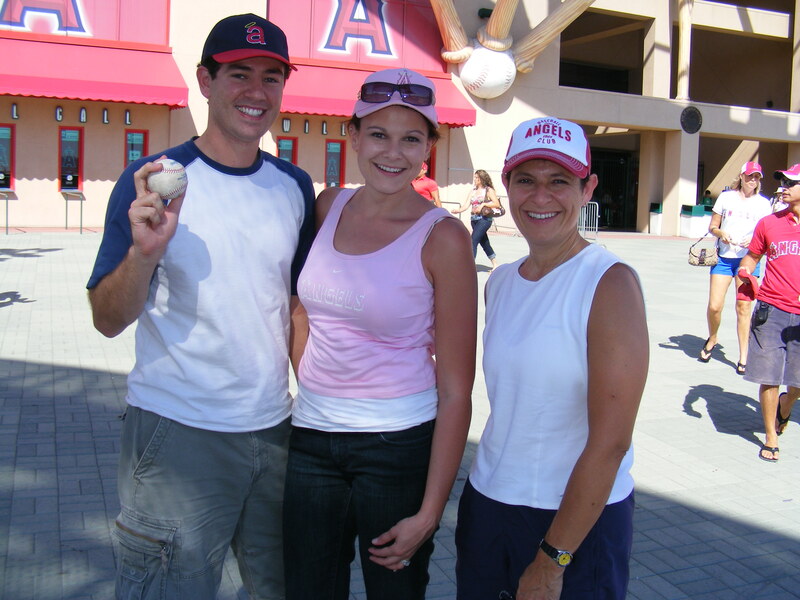 First foul ball, 99th baseball overall… I’m hoping to get number 100 on Friday when the Angels play the A’s. All right! Back at the Big A with my wife and a fine summer evening of baseball. We arrived plenty early and I took a spot in line while Michelle sat in the shade. 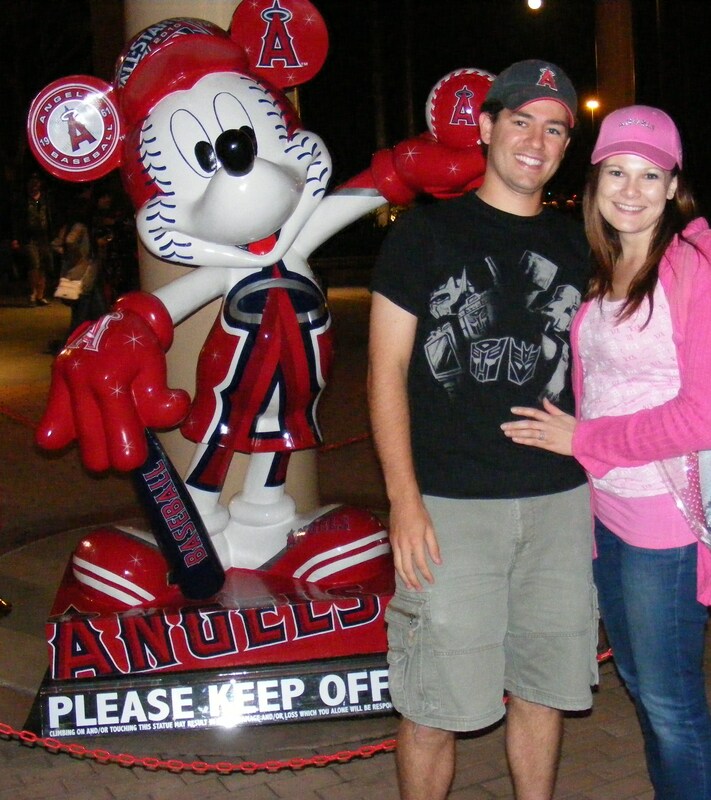 Actually, you can see Michelle in the background of that photo as she checks out the Nick Adenhart memorial. It’s always changing as people add to it… August 24th, 2009 would have been Nick’s 23rd birthday. R.I.P. I was the first one there and arrived just in time to watch Frank Robinson enter the gates after totally snubbing a Detroit Tigers fan. Ouch! Soon enough the lines were growing and I saw John, Terry, Rob, and Chris (all Anaheim BP regulars) around me. The security guard for my line was late gettin’ with the program so Rob beat me up to the pavilion but there weren’t any Easter eggs to be found. He looked up, smiled, and side-armed Ball #1 right to me. Awesome! I’d never gotten a ball from Torii before. I told him, “Thank you! It’s good to have you back, Torii!” And he gave me a thumbs up–this game would be his first home game back since he’s been on the DL. I just kept being out of place for the few homers that went up there during BP. I saw a few Angels pitchers in right and thought Shane Loux was one of them. I headed down to the front row and got right above where Loux was fielding and said, “Is that Shane down there?” No response. He turned around and looked up saying, “Thank you.” He pointed to me with his glove. Cool. About five minutes later I was in the fourth rows of the stands trying to catch a homer by Gary Matthews, Jr. A ball went to Loux and he turned around, wanting to toss it to someone. I put my arms up and waved halfheartedly… and he tossed it over a half dozen people in the first row straight into my glove. For the record, I never asked him for a baseball… but I sure appreciate having it! Note to self: that birthday stat on the rosters I print out comes in handy after all. After the Angels finished hitting I got entirely shut out! Not too many homers made it up to us in RF and those that did were just too far from me. I almost got two or three… but almost only counts in horseshoes and hand grenades, as my dad says. After BP I found Michelle in the seats further up in the pavilion and we found some shade on the Terrace Level and ate our dinner we’d brought in with us. The Angels Strike Force made their rounds and I snagged my third ball of the day… but it was made of soft plastic and foam. I’ve snagged three of these Softee balls this year without really trying too hard. Too bad they don’t count in the standings of the Ballhawk League! 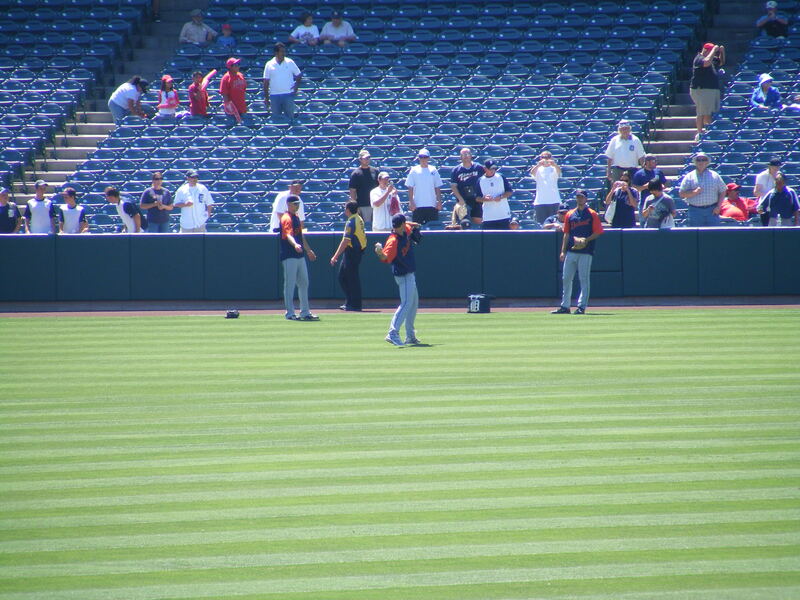 I saw Justin Verlander come out and warm up near the line in right. When he started throwing I sat behind the bullpen catcher in case of an overthrow. Geez! Verlander’s got some great movement on his pitches. Neither he nor the catcher tossed a ball to anyone… but Michelle mentioned that a player was signing closer to the dugout. I took a closer look and saw Curtis Granderson–he posed for some photos and signed for a good ten minutes! I got him on my ticket from that game. 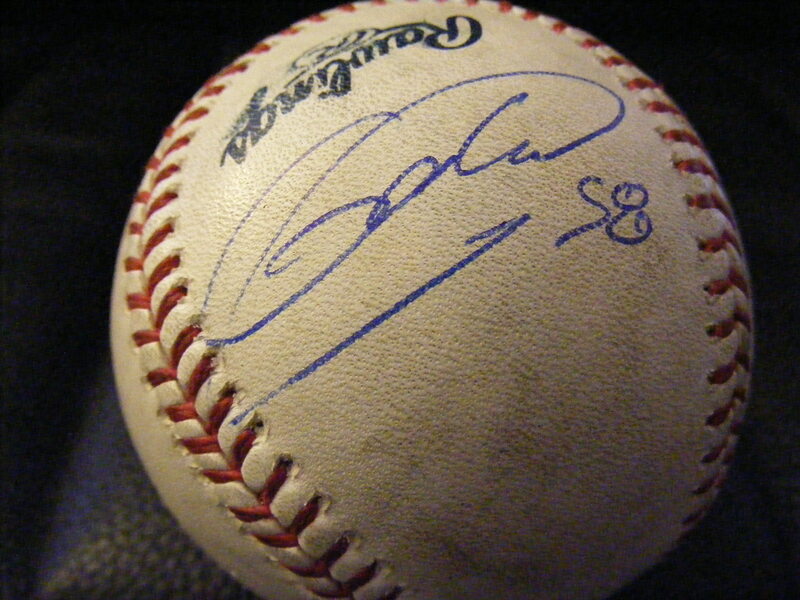 Lemme tell you, some of these ballplayers don’t try very hard when signing their name. Ugh. Thanks anyway, Curtis, for taking the time. Your fans appreciate it. Nice foul ball spot, eh? Verlander throws hard… I figured a lot of foul balls from the Angels batting left-handed (Figgins, Abreu, Izturis, Morales, Aybar) would make it up this way. Nope. Only one close call. We watched most of the action from up there. It was fun though the game looked like it was all set to be a walloping. 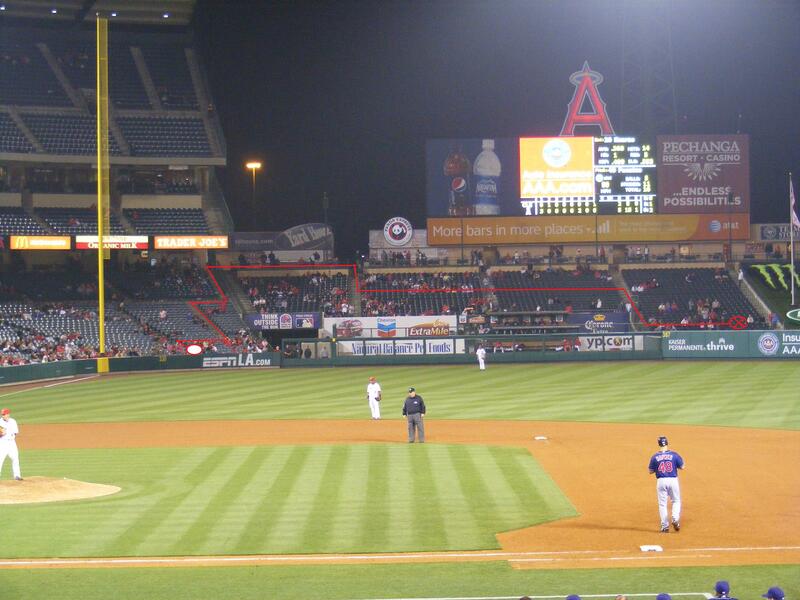 At one point the Angels were down 10-0. 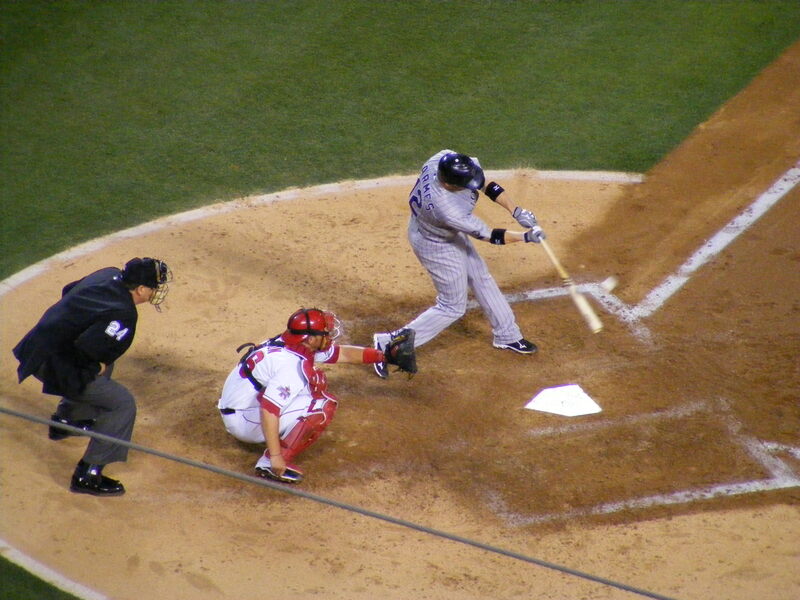 BTW, Miguel Cabrera is a fantastic hitter. He went 3-5 with 5 RBIs and he is now hitting .341! Yowza! 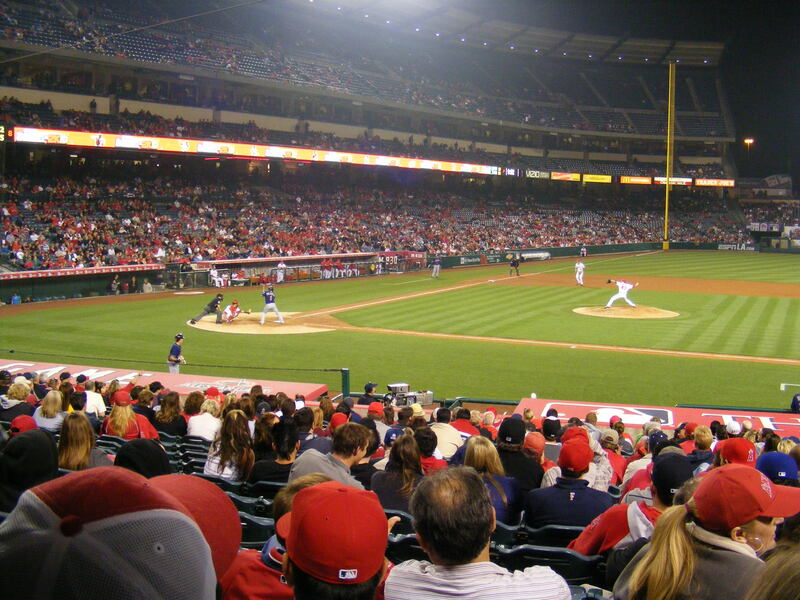 The Angels made a comeback though and knocked Verlander out of the game in the sixth. They beat up on the Tigers bullpen a little, too… it was 10-7 after Bobby Abreu knocked a three-run homer of the fence in right field. Fernando Rodney came in and got the final four outs of the game though… and I was right behind the dugout as the players came off the field. The only thing that got tossed to me: a piece of Sugar Free Double Bubble by current coach and former player Andy Van Slyke. 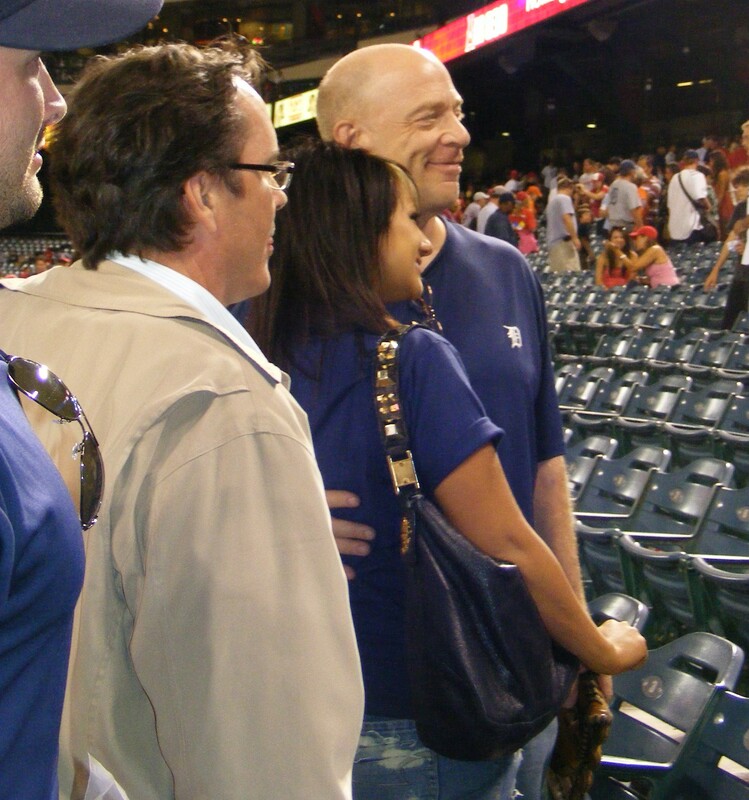 Oh, and Michelle and I saw actor J.K. Simmons in the crowd behind the dugout at the game’s end. He signed a few autographs and posed for some photos. Apparently he is a BIG Tigers fan. He was born in Detroit in ’55 and, here’s some entertainment/sports trivia, he played the manager of the Tigers in the Kevin Costner film “For Love of the Game.” Cool, huh? ught his glove to the game. Props to you, J.K.
tt on 2015 Has Begun!